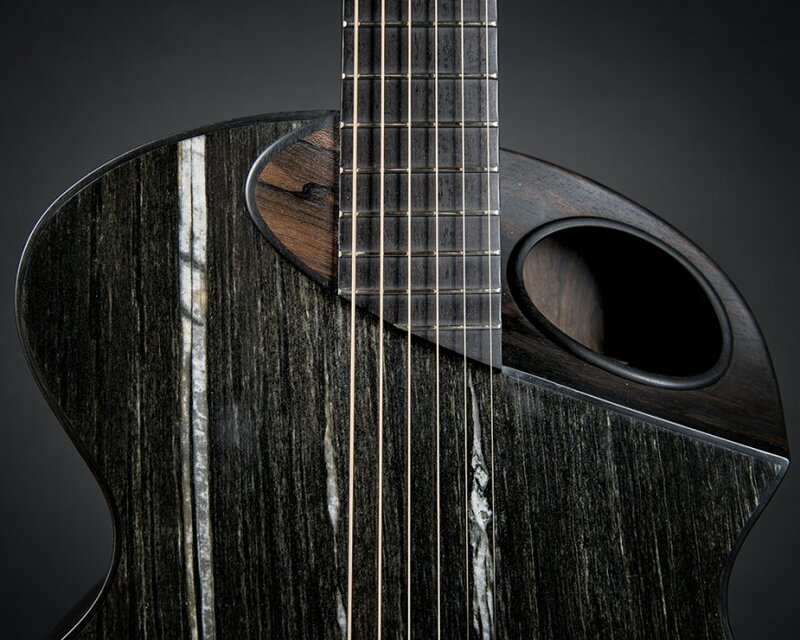 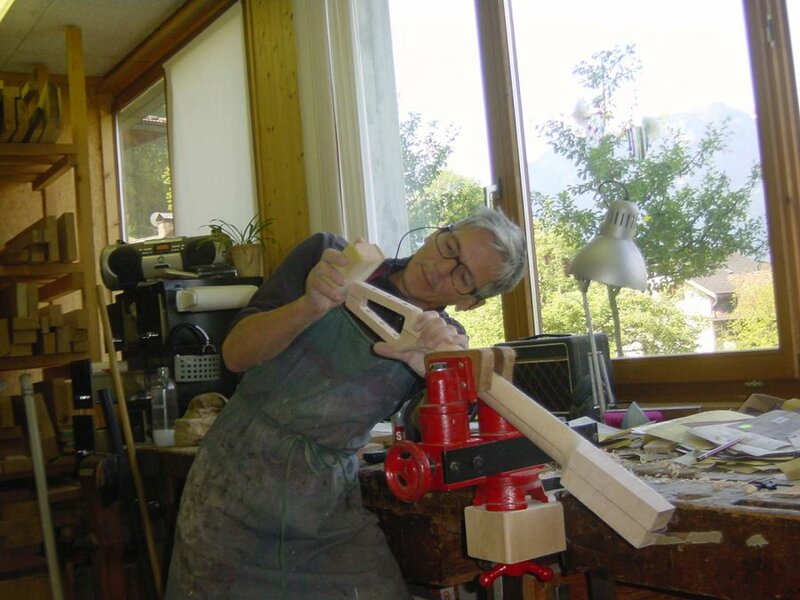 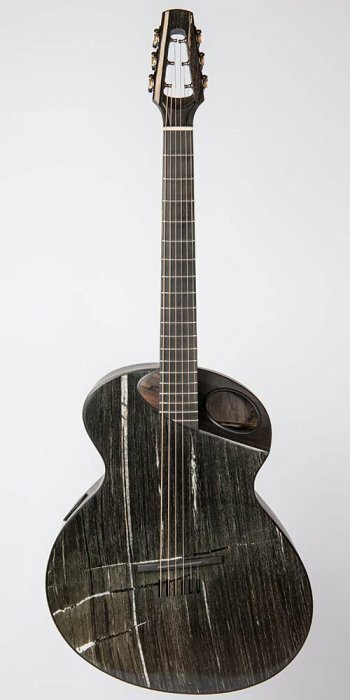 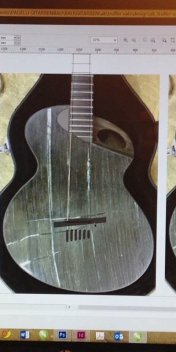 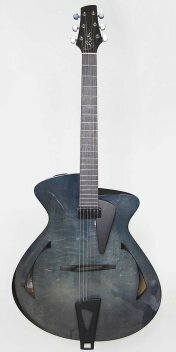 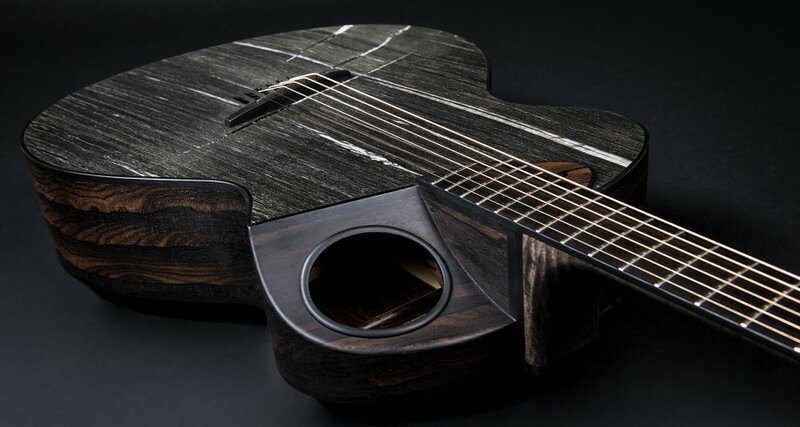 Built for Pius Truffer, owner of a natural stone quarry in Vals, Switzerland (see Custom Made section), this guitar’s unusual features only begin with the fact that it has a stone top. 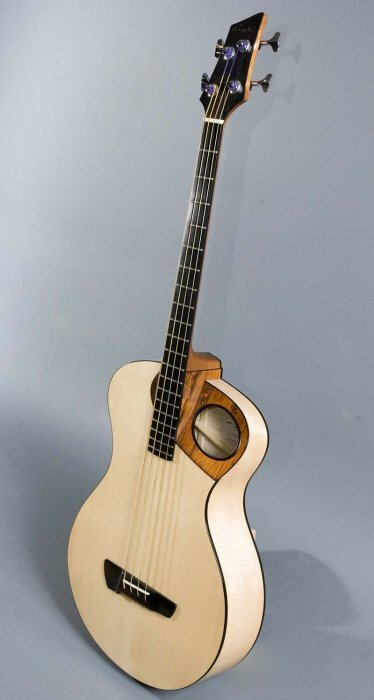 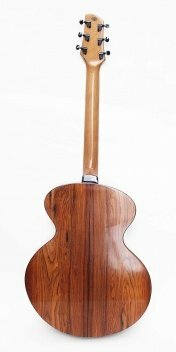 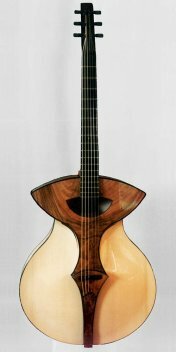 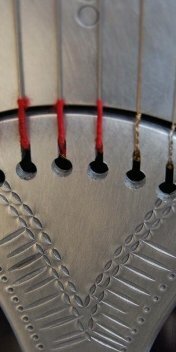 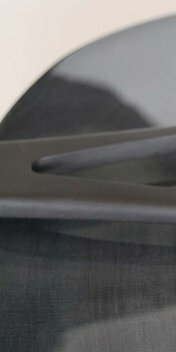 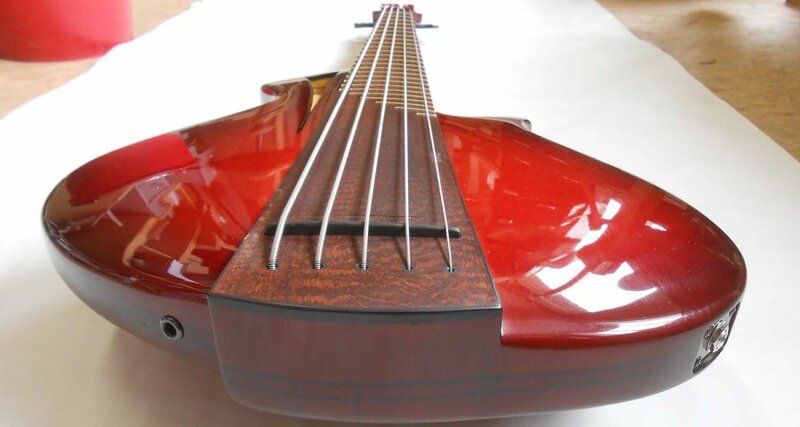 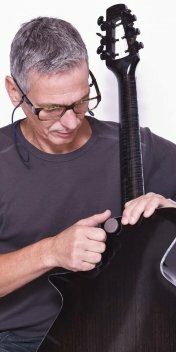 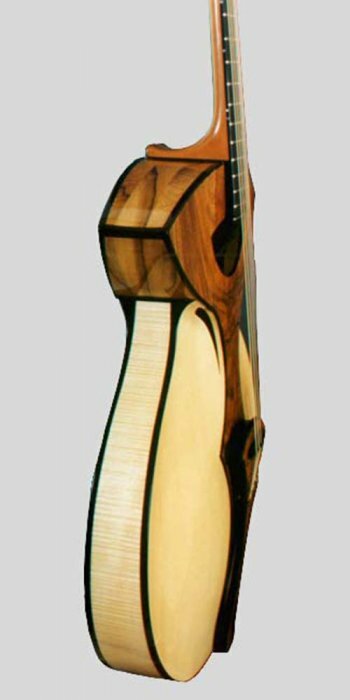 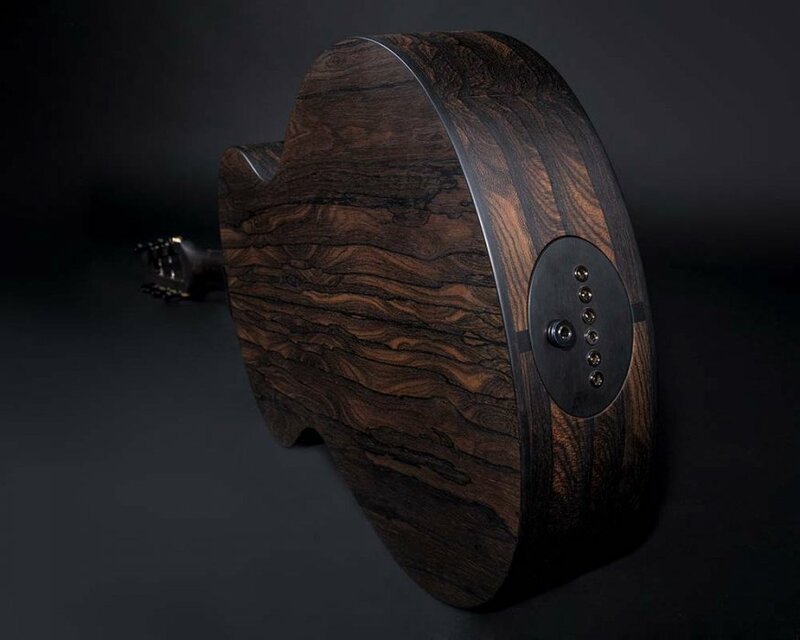 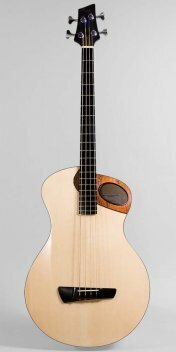 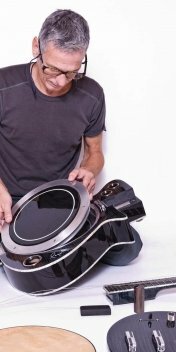 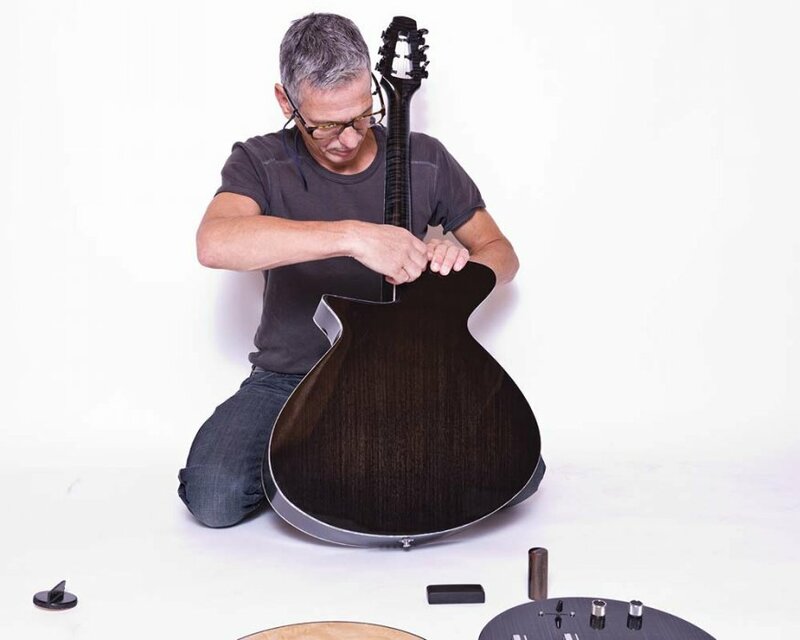 Other innovative elements include our Top Cut with an integrated soundhole - a design that we first used on the Stalder Acoustic Bass, and which allows the entire top surface to vibrate freely. 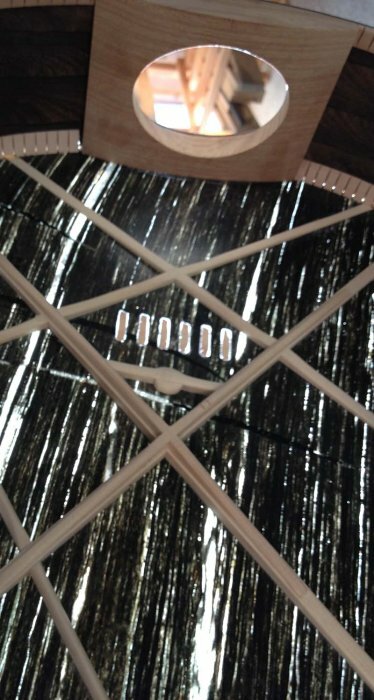 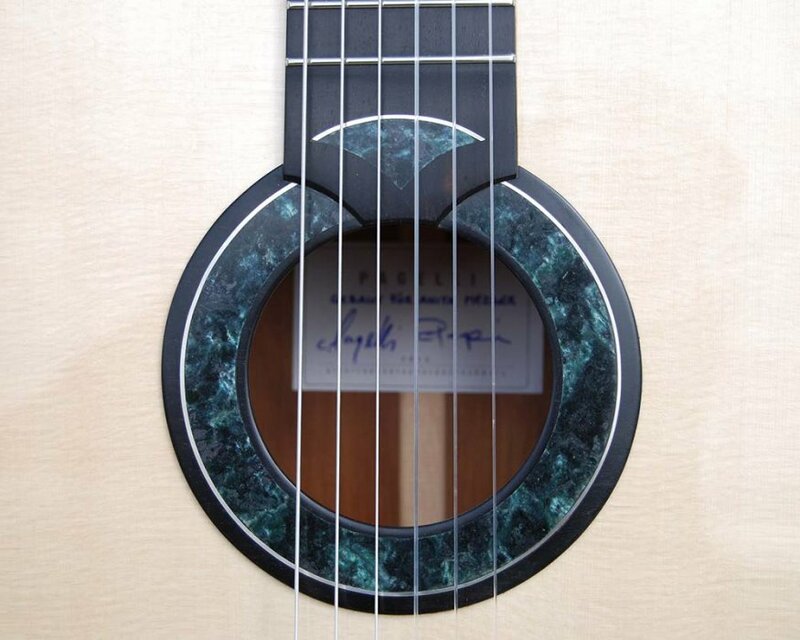 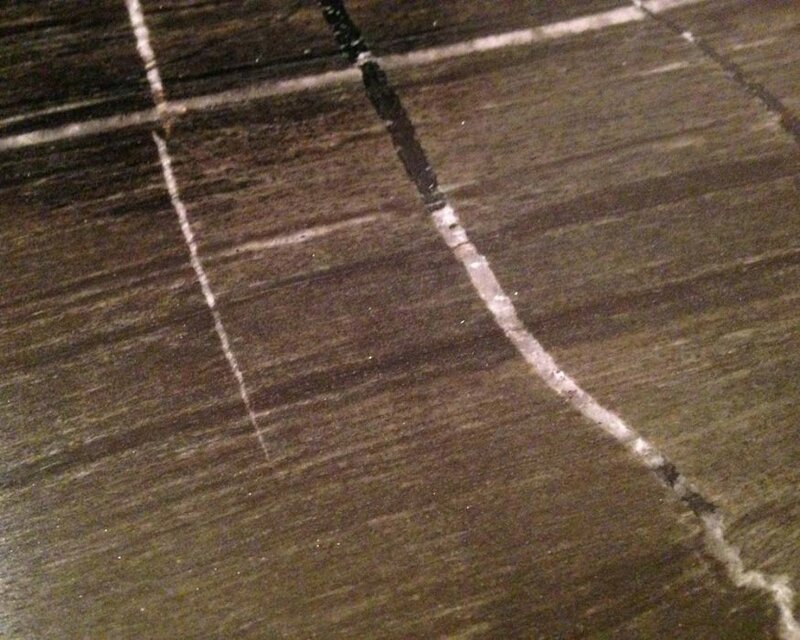 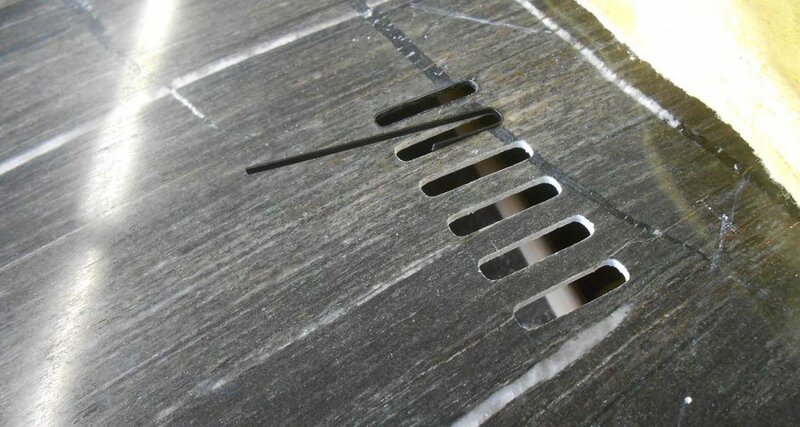 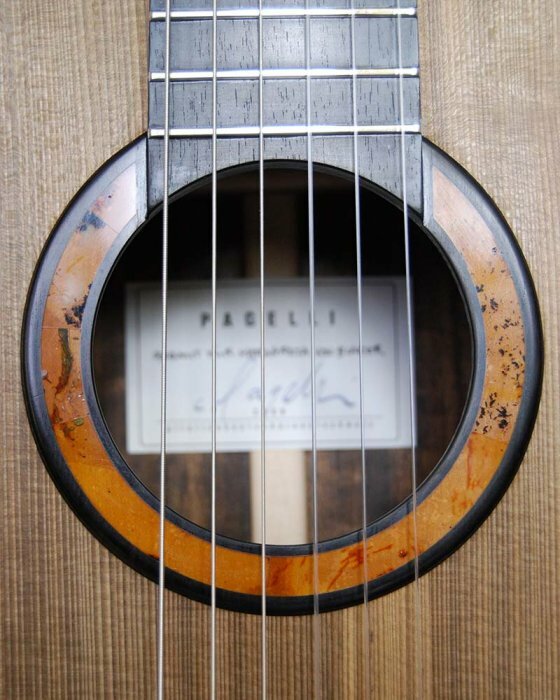 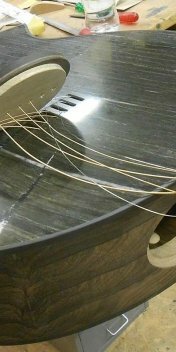 Uninterrupted by a soundhole in its center, it also shows off the stone’s natural beauty. 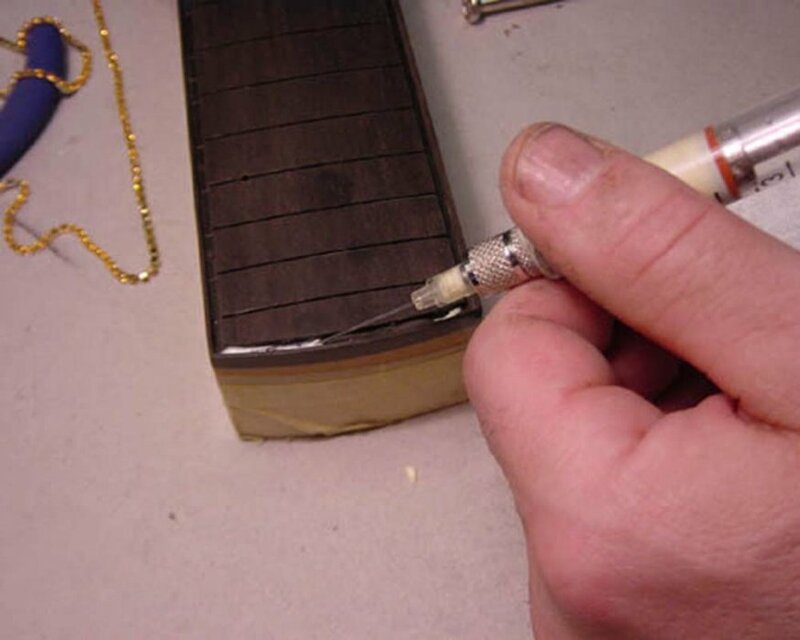 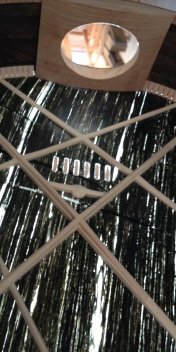 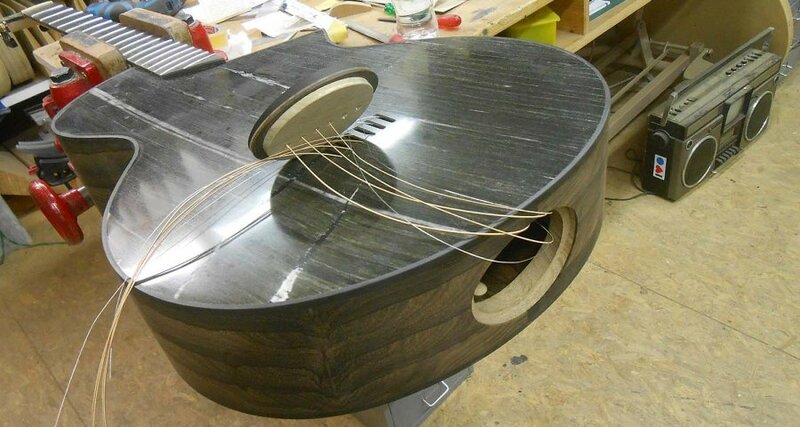 As far as we know, the guitar’s string-path through the top is another first. 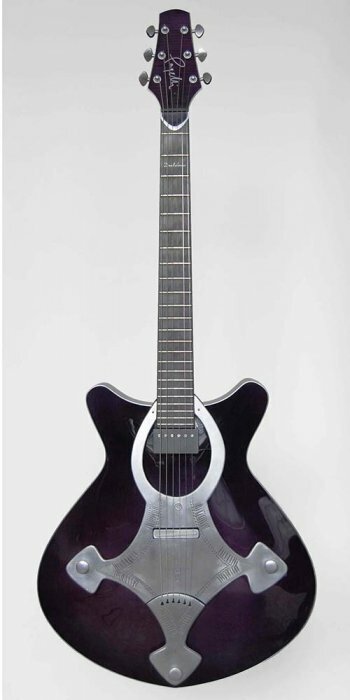 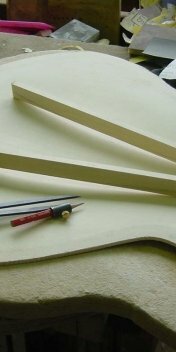 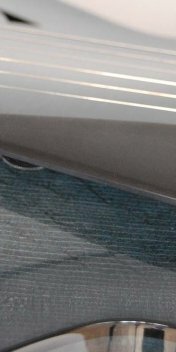 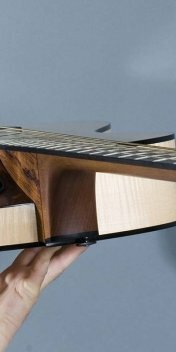 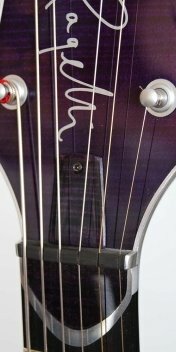 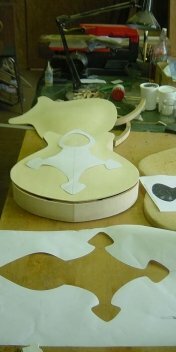 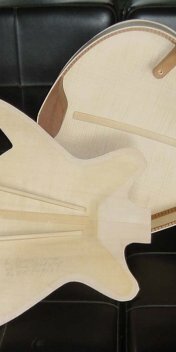 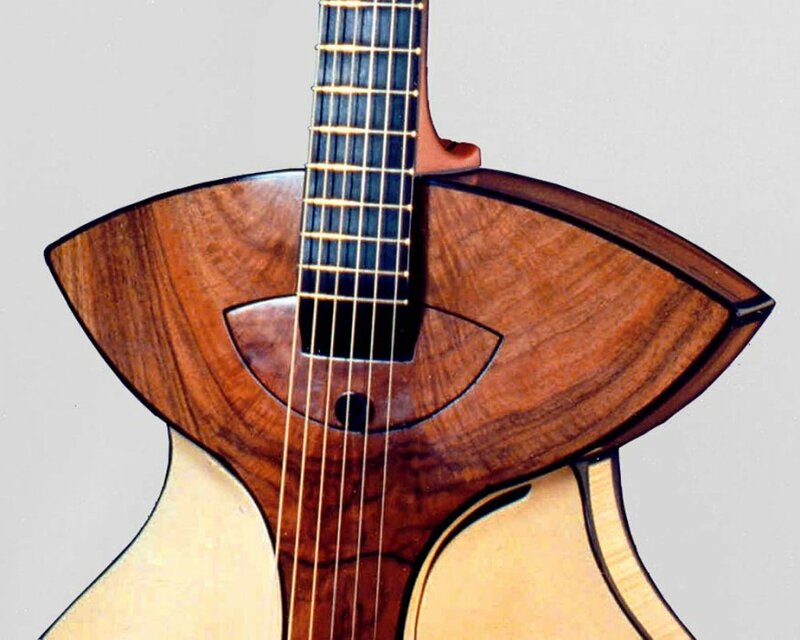 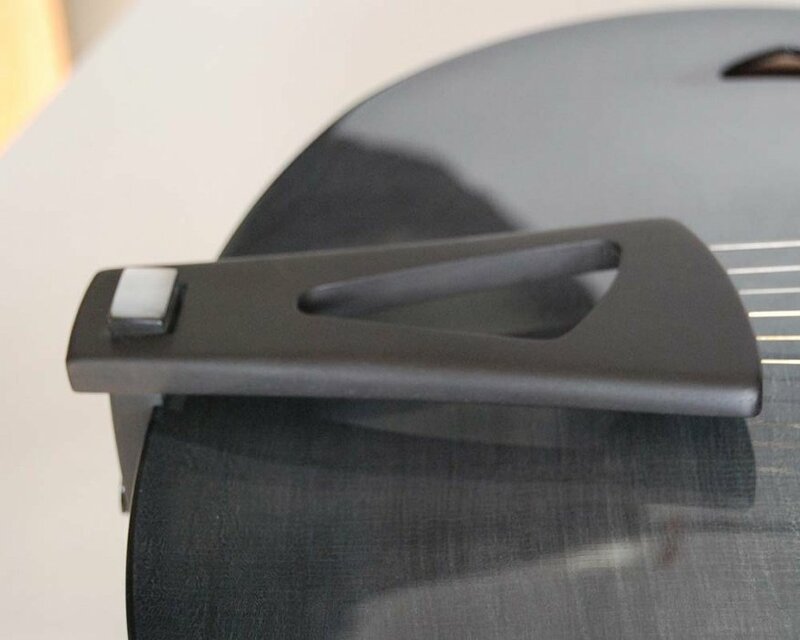 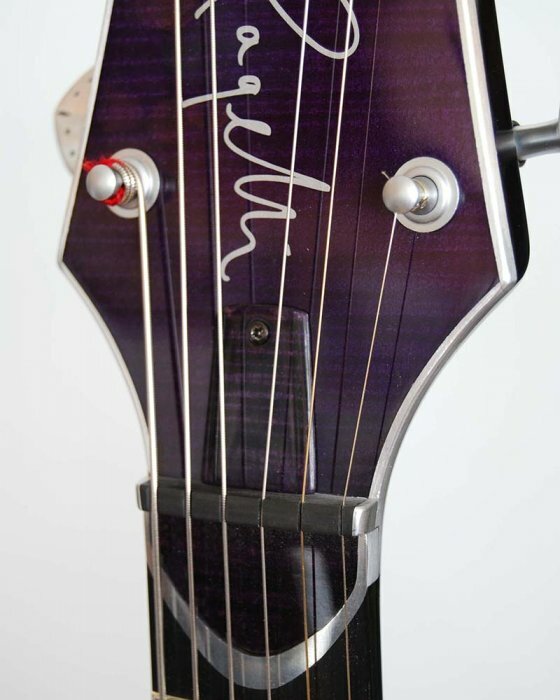 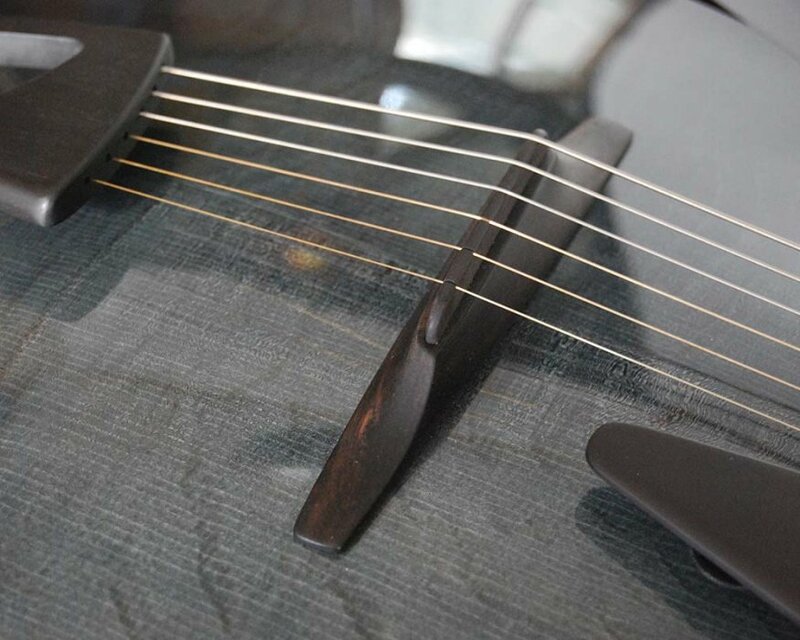 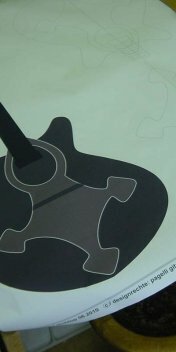 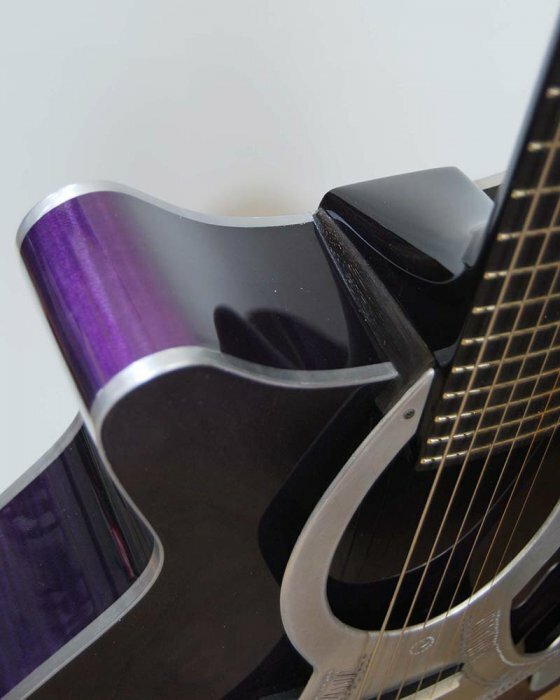 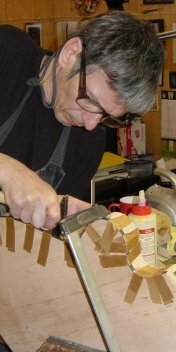 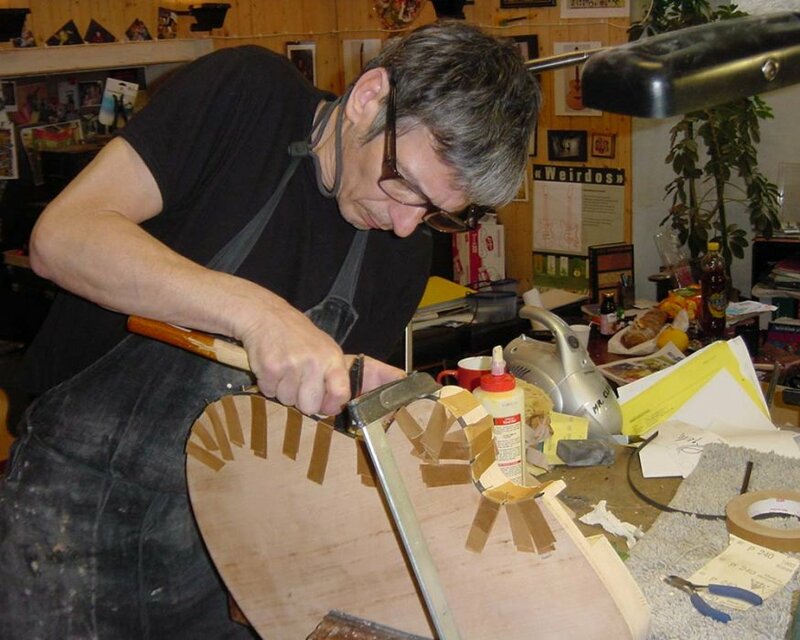 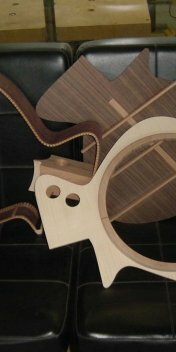 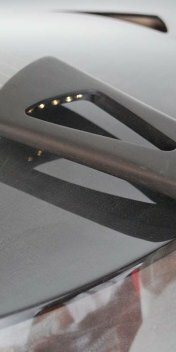 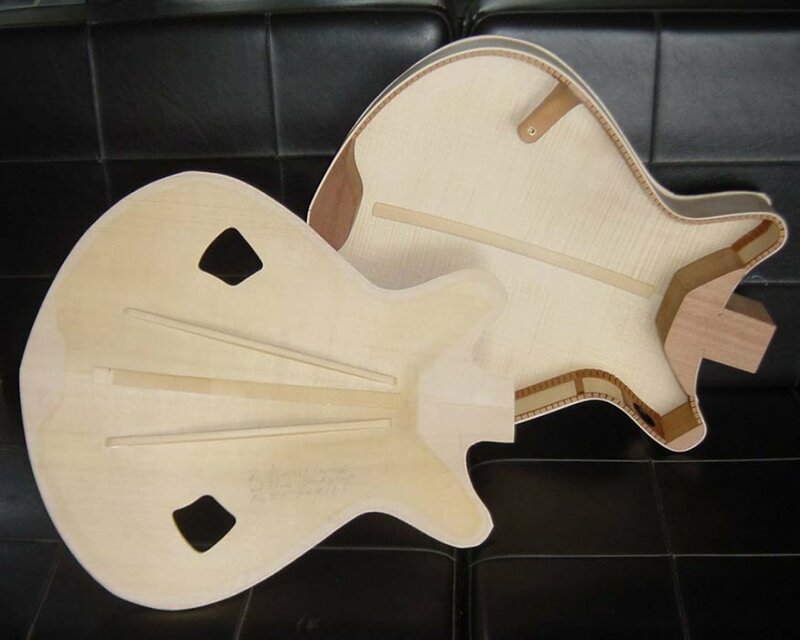 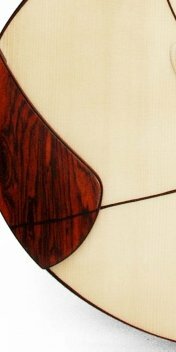 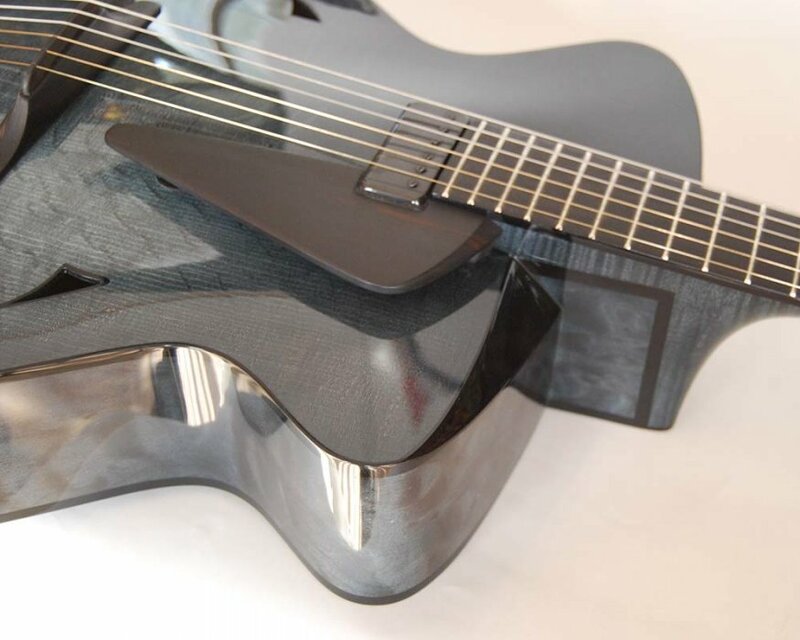 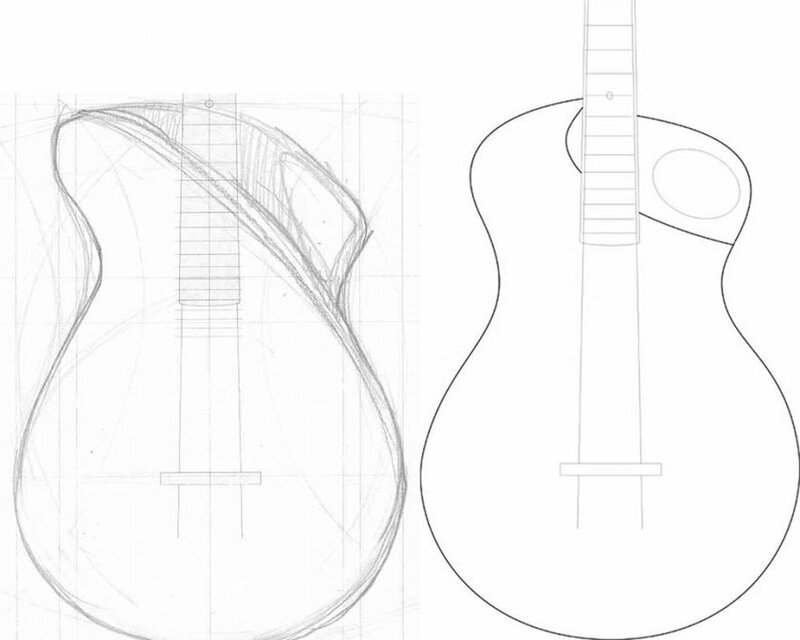 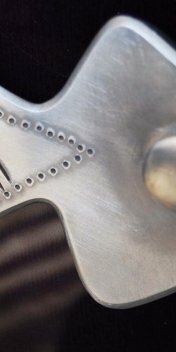 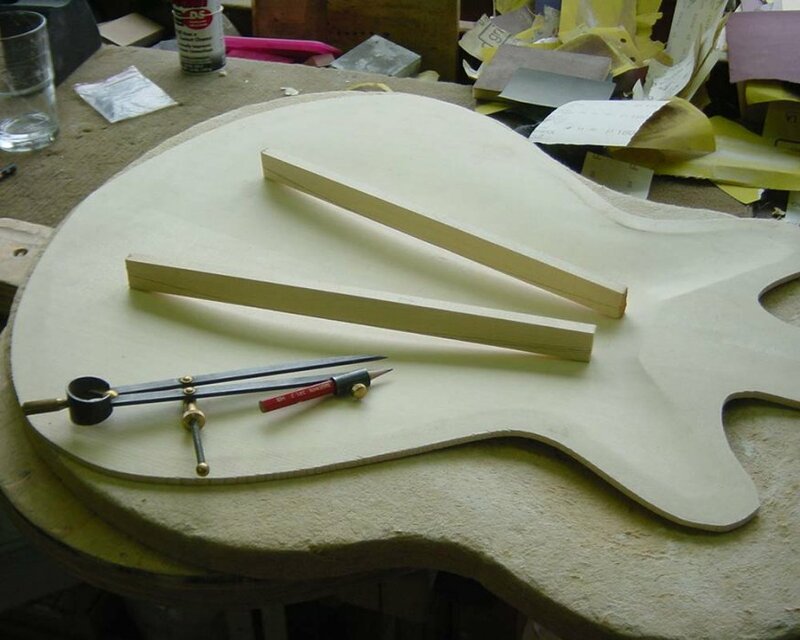 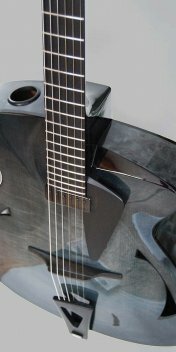 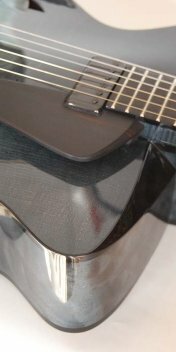 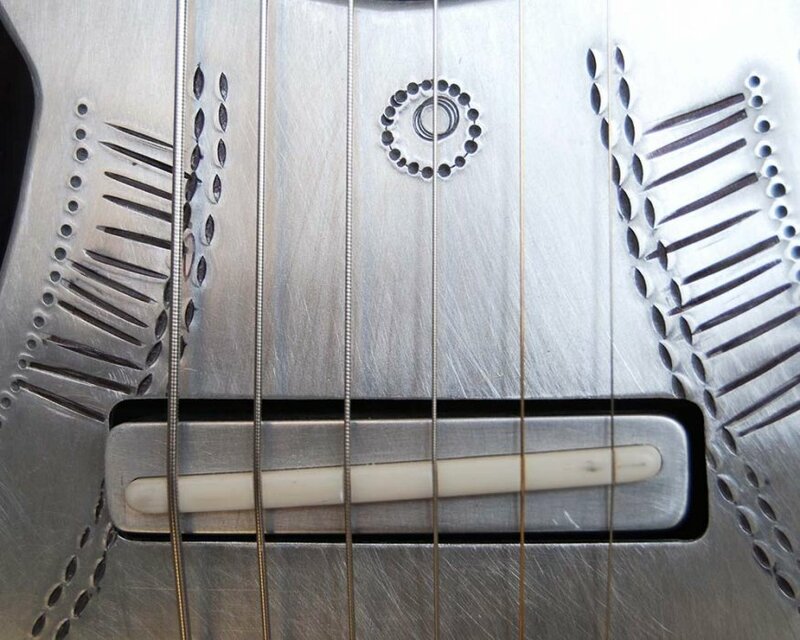 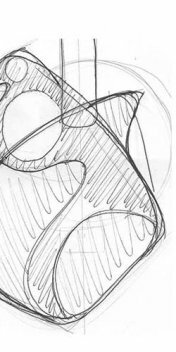 Providing the necessary string angle over the guitar’s archtop-style bridge, this design is a key element in the instrument’s success as a «flattop-meets-archtop» concept. 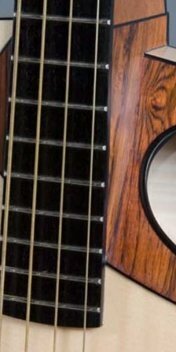 First introduced on our Golden Fretless Bass in 1997, a fingerboard that continues all the way to the instrument’s bridge is still an innovative feature today. 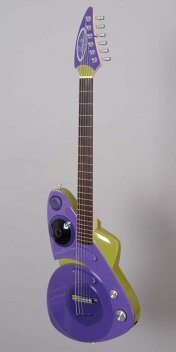 The design allows for long sustain and playablity into the highest range, but of course it only works if there’s no pickup in the way. 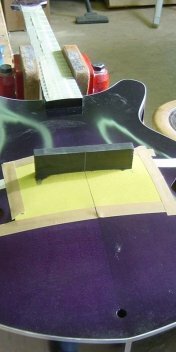 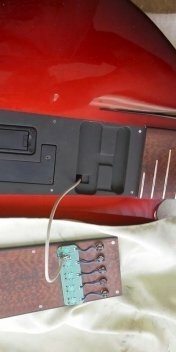 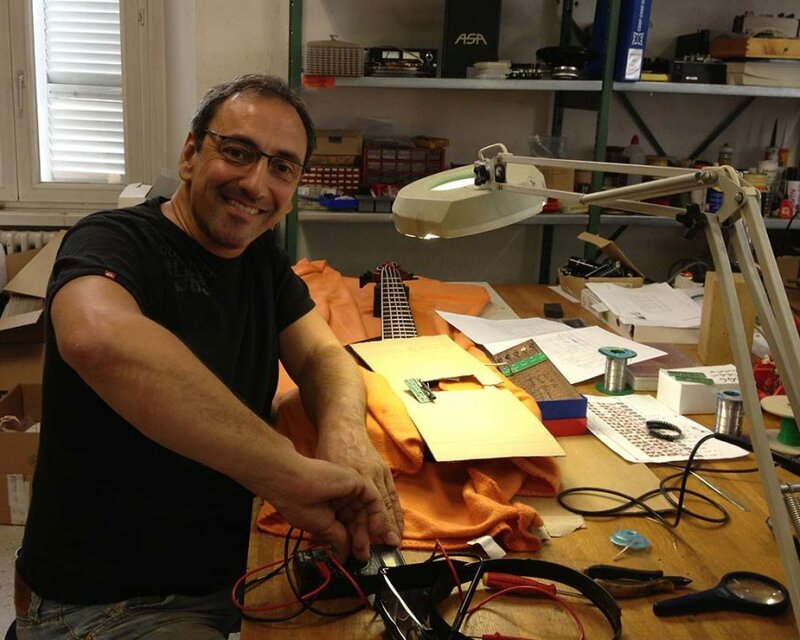 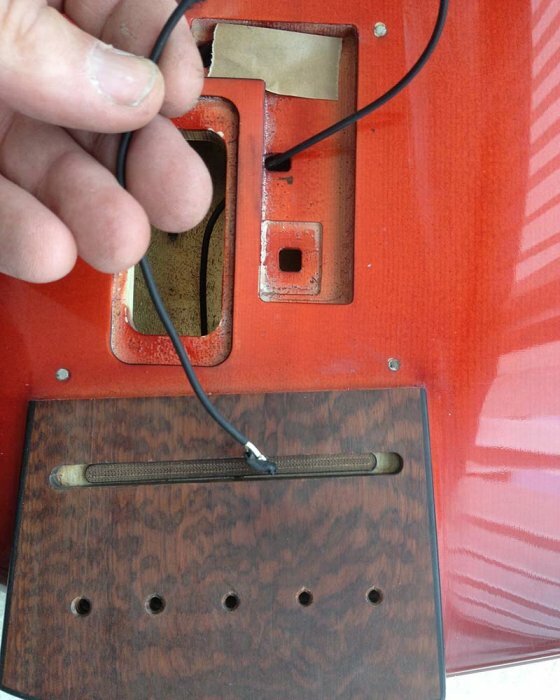 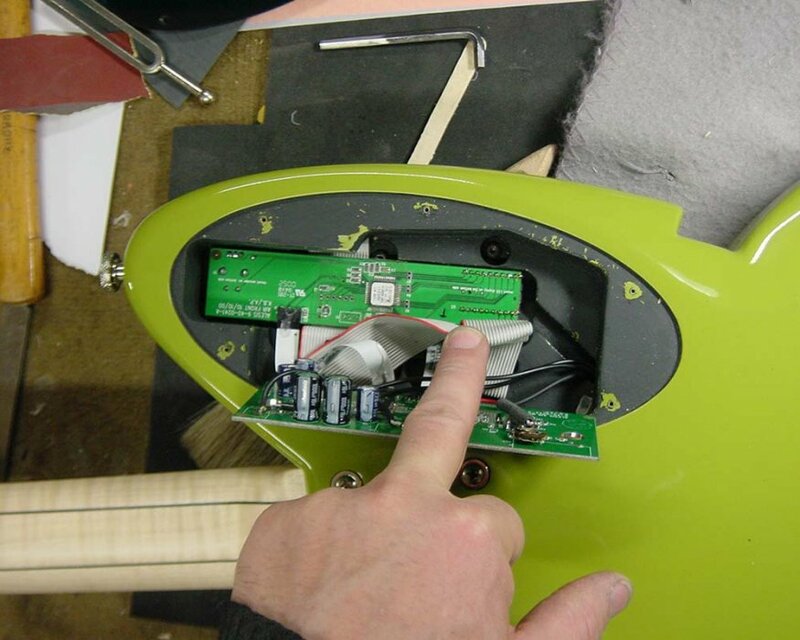 As a result, the instrument’s removable (held in place with magnets) fingerboard section, which conceals a compartment for the pickup, preamp and battery, is another innovation. 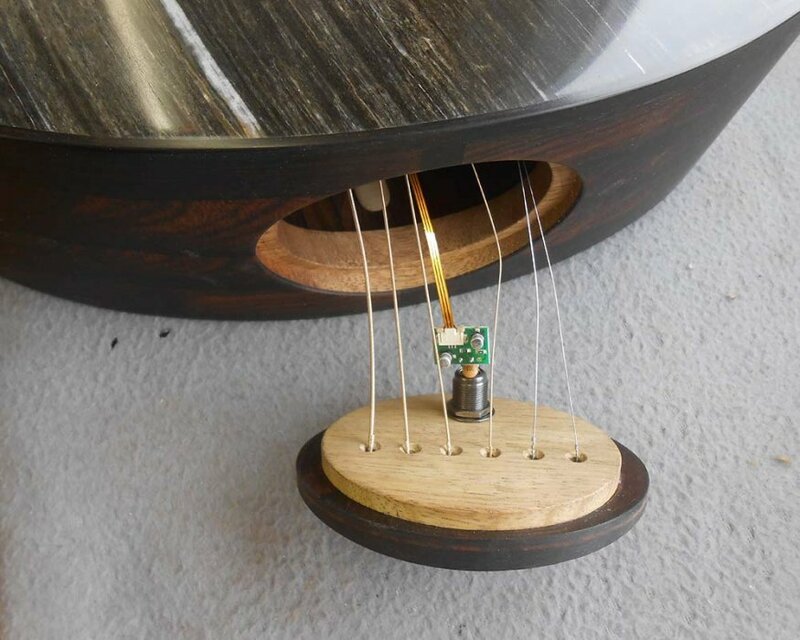 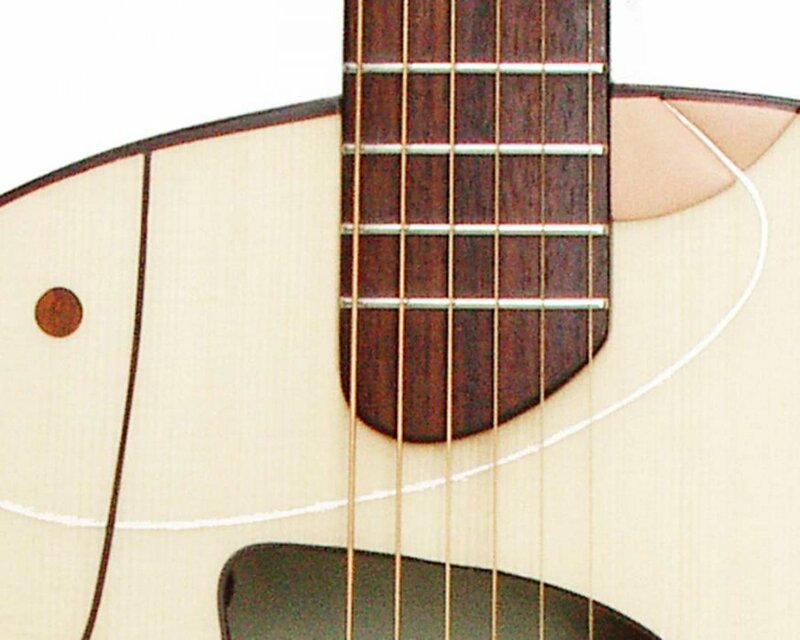 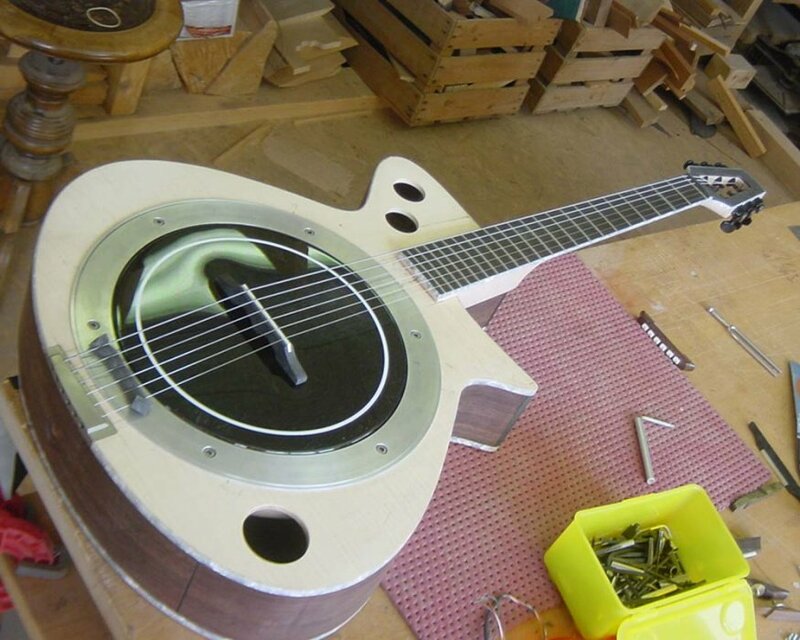 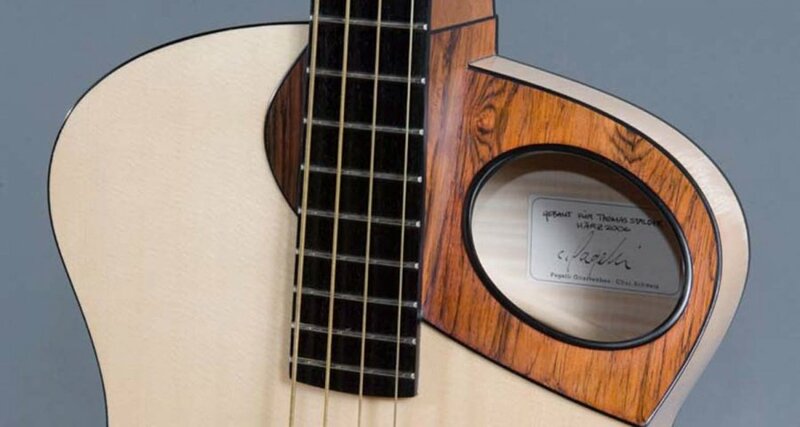 Controls for volume and tone are mounted virtually invisibly inside the soundhole. 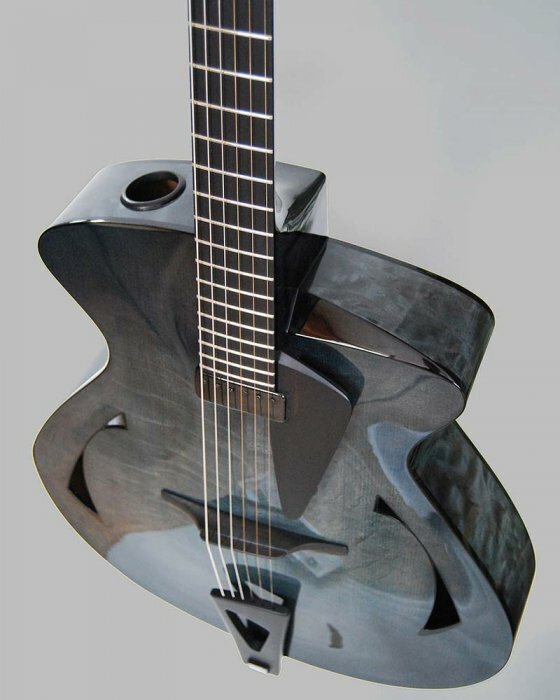 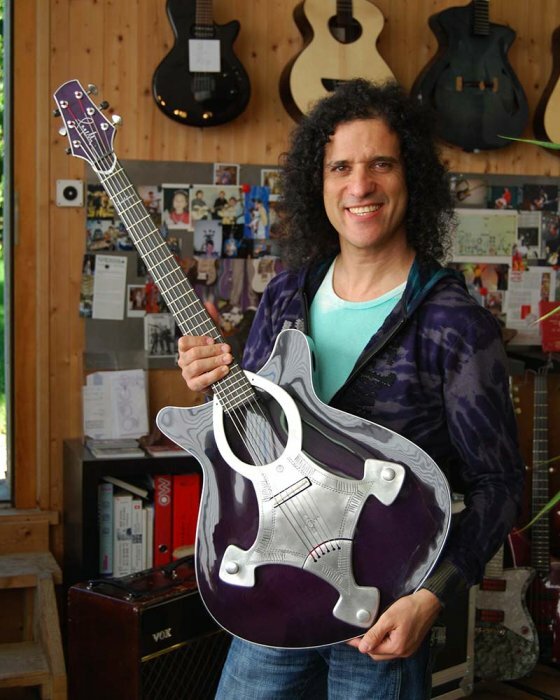 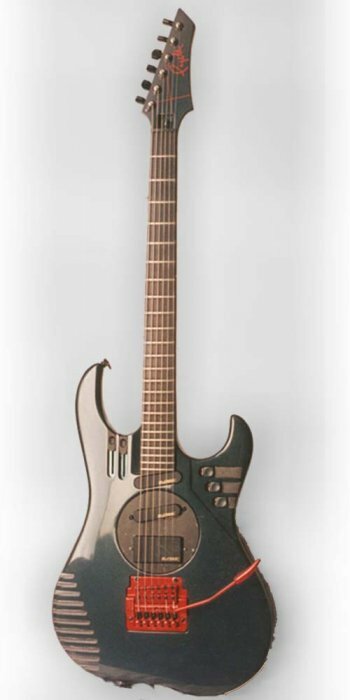 OK, so this one is over the top: a guitar that can be four or more guitars! 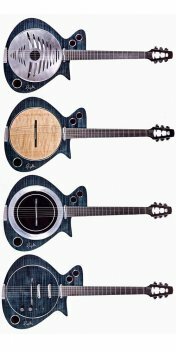 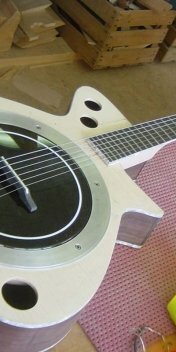 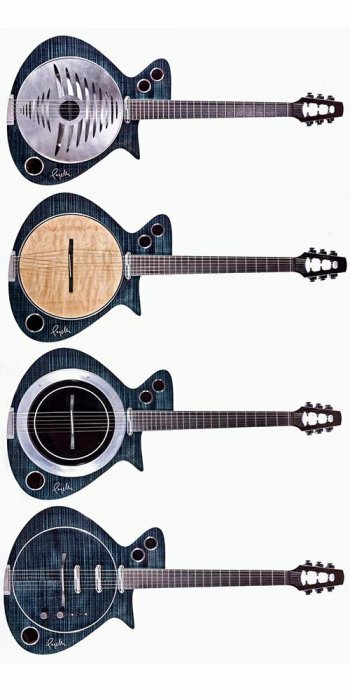 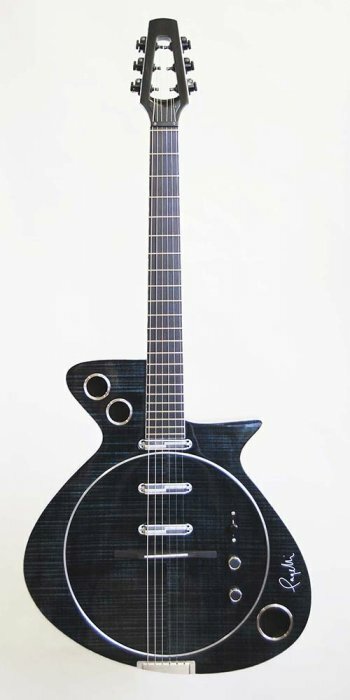 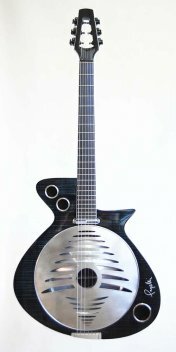 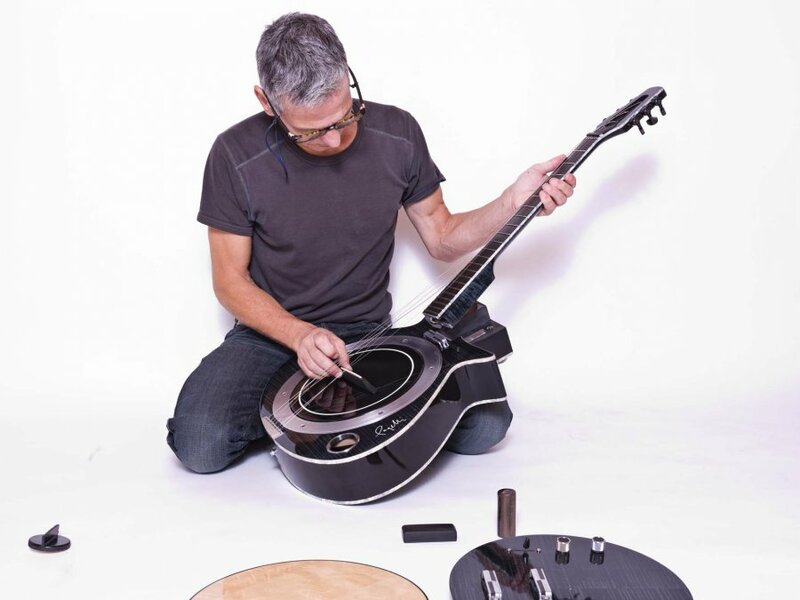 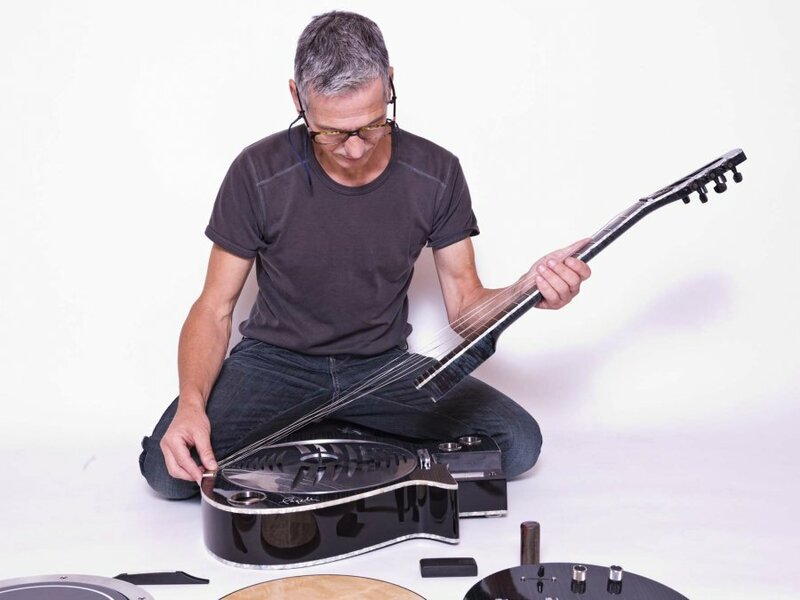 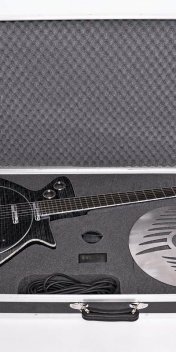 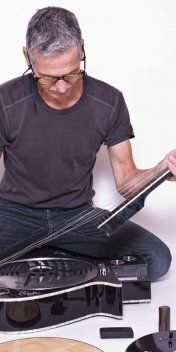 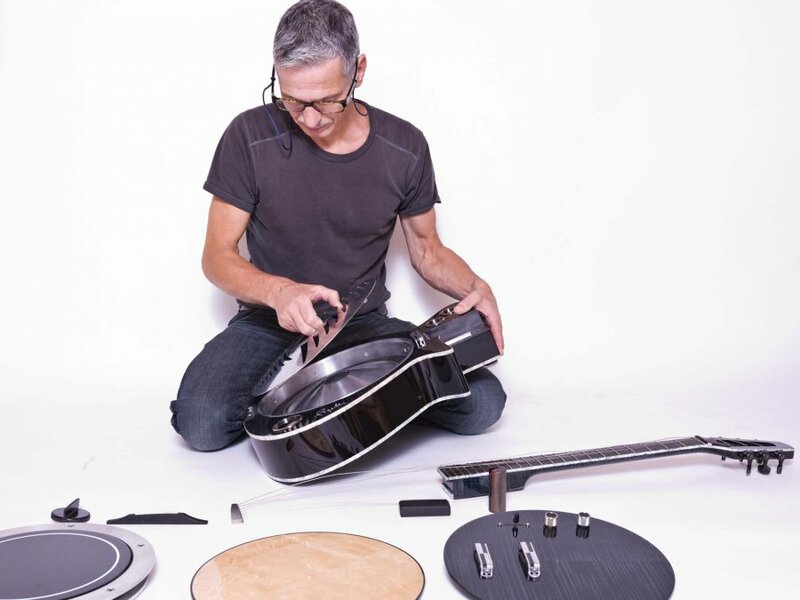 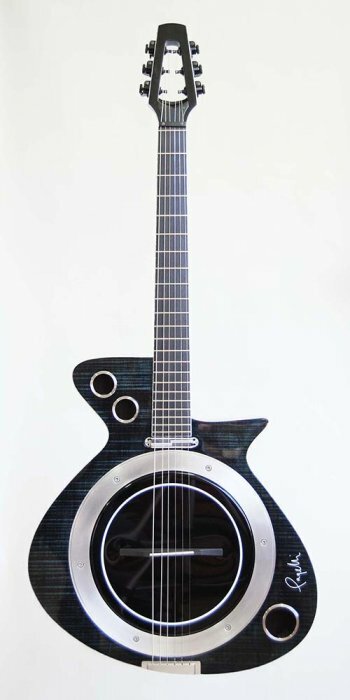 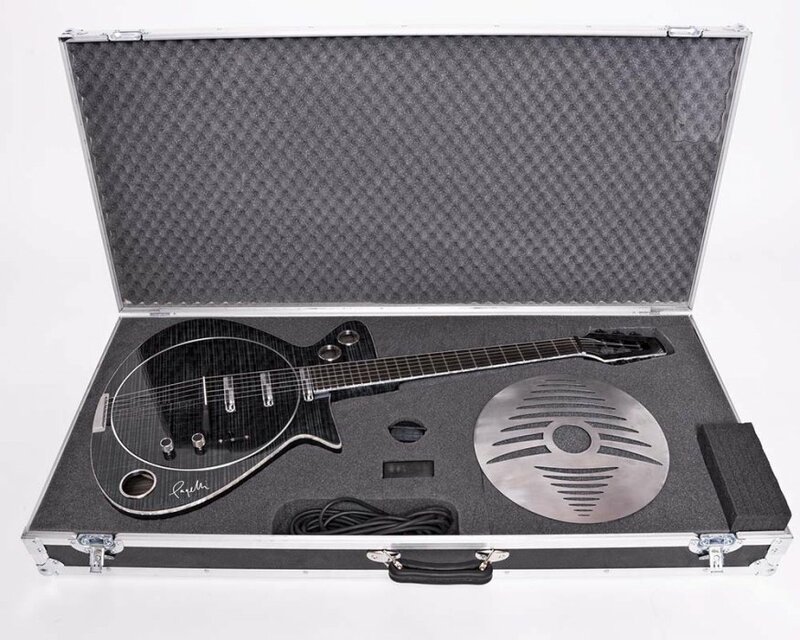 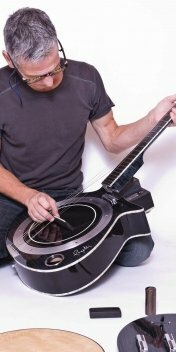 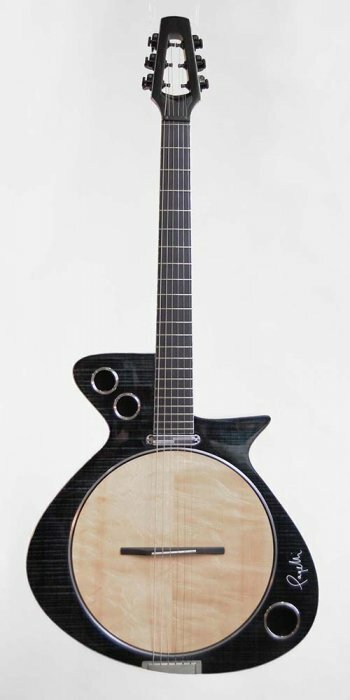 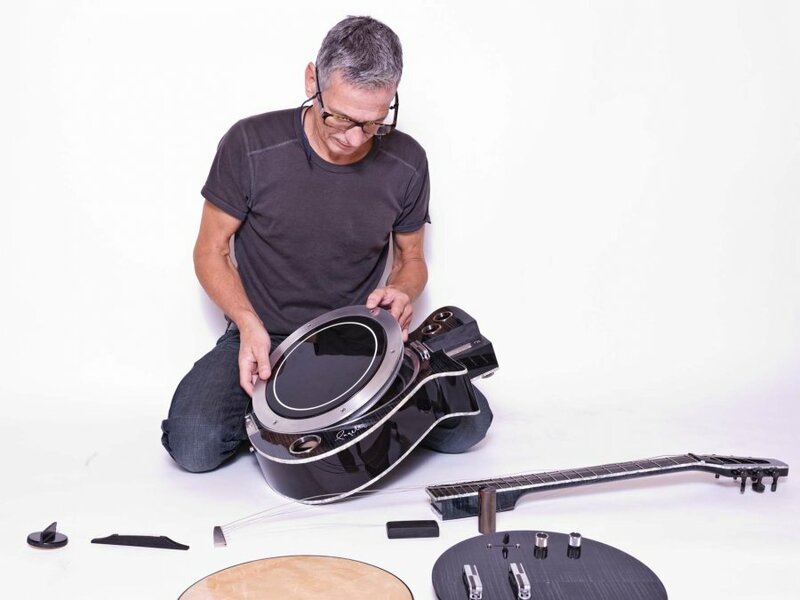 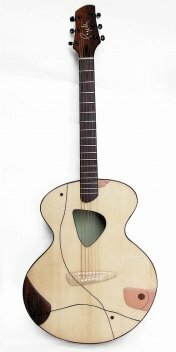 Using removable top inserts, the Convertible can be configured as an acoustic, an electric, a resonator guitar, or a six-string banjo. 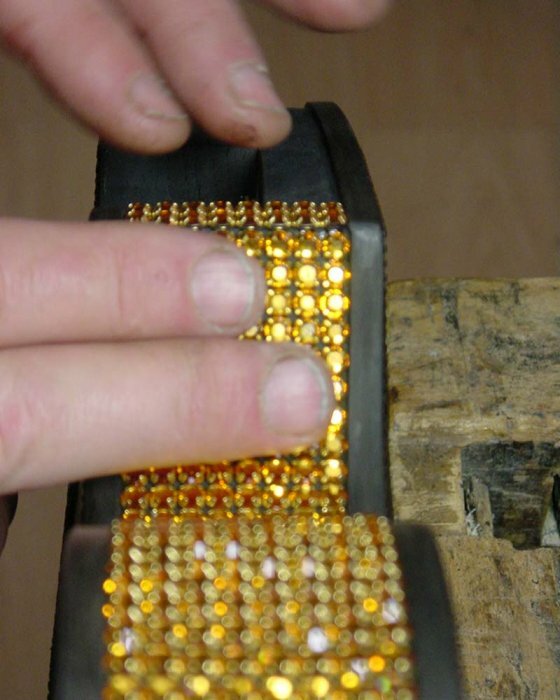 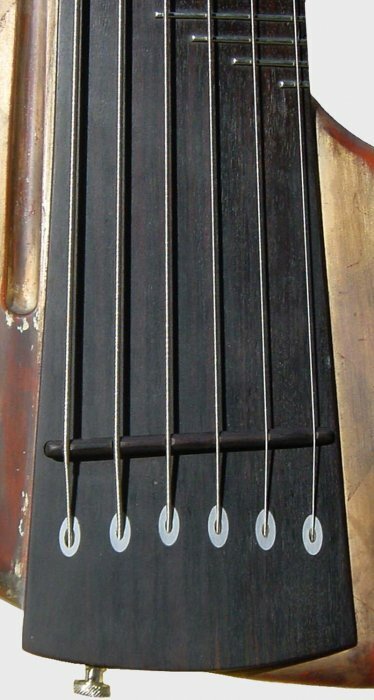 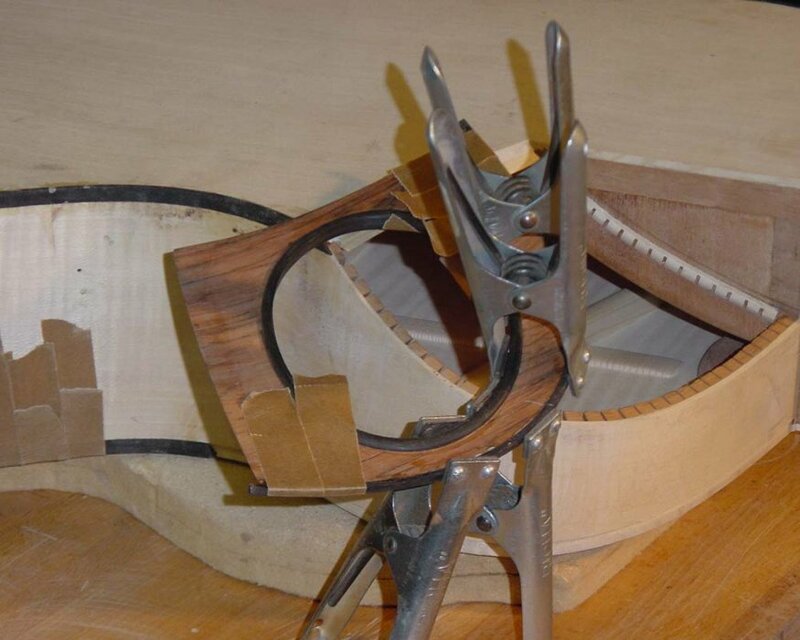 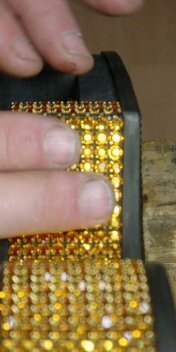 In addition, a sitar bridge can be added to each insert, bringing the total number of possible sounds to eight! 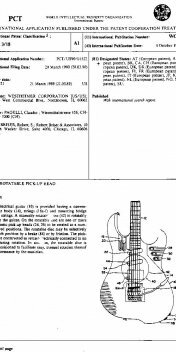 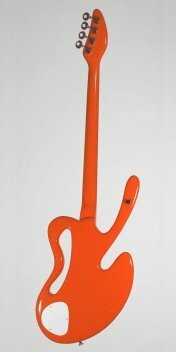 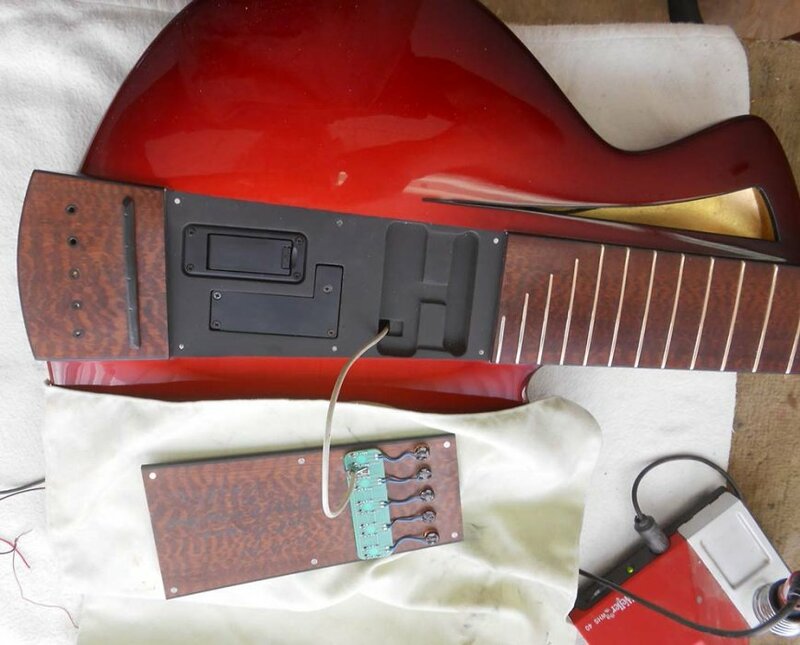 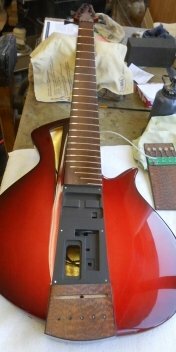 And because the neck is easily removed with a single screw, the Convertible can also be a travel guitar. 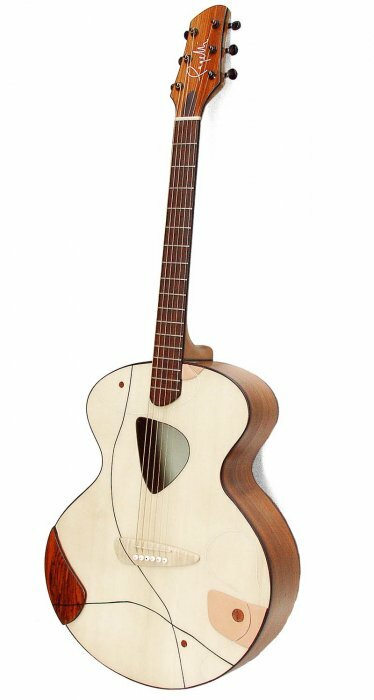 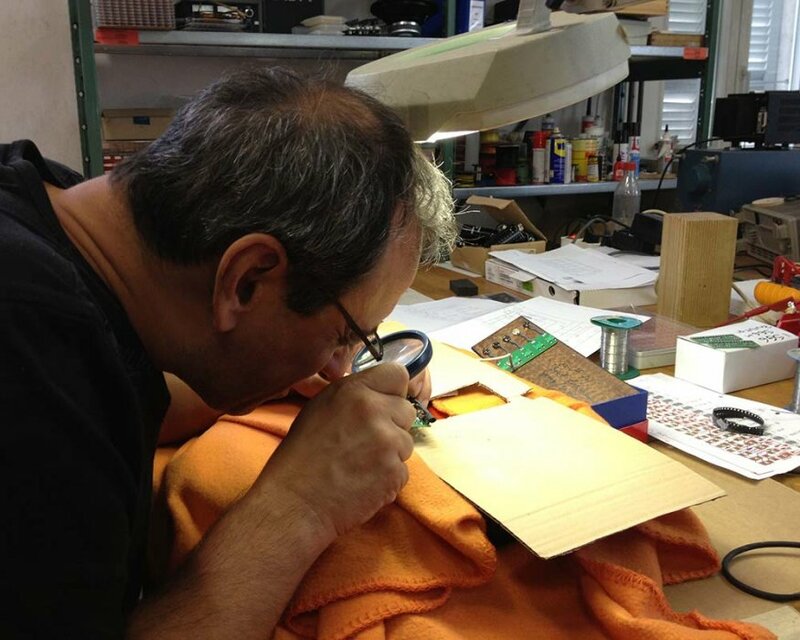 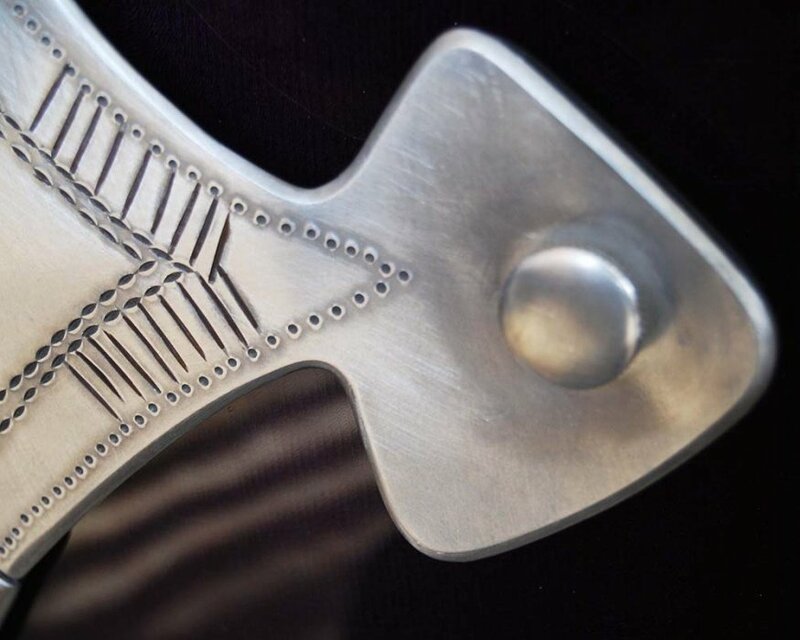 Djamel Laroussi specified that his band logo - an ancient Touareg cross - would be part his guitar’s appearance (more about that in the Custom Made section), so we figured out a way to prominently include the symbol into the instrument’s design. 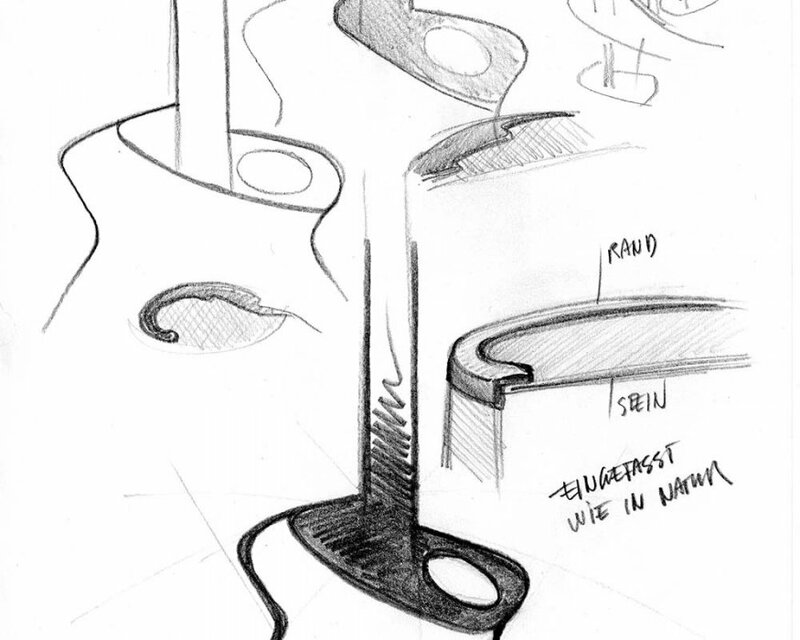 But while we think that it’s quite pretty, the innovative part goes beyond aesthetics. 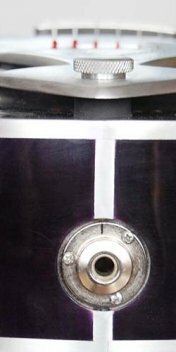 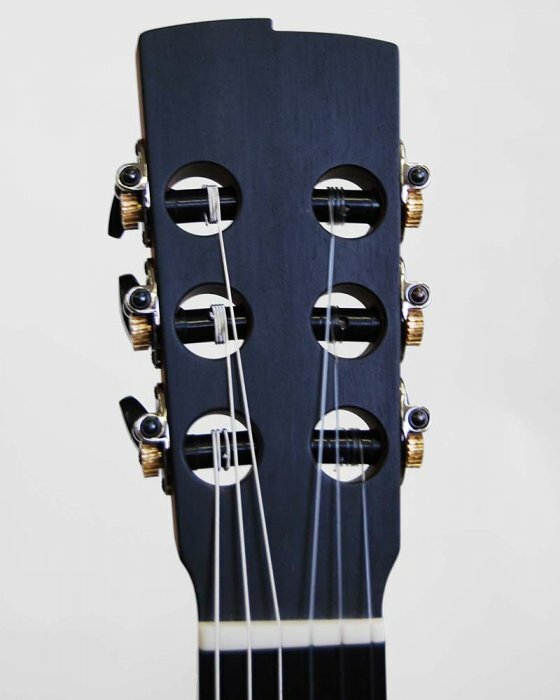 Serving a practical purpose, the cross serves as an adjustable cover for the f-holes. 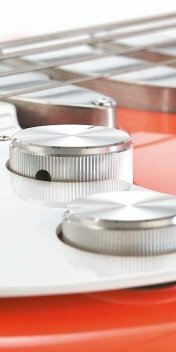 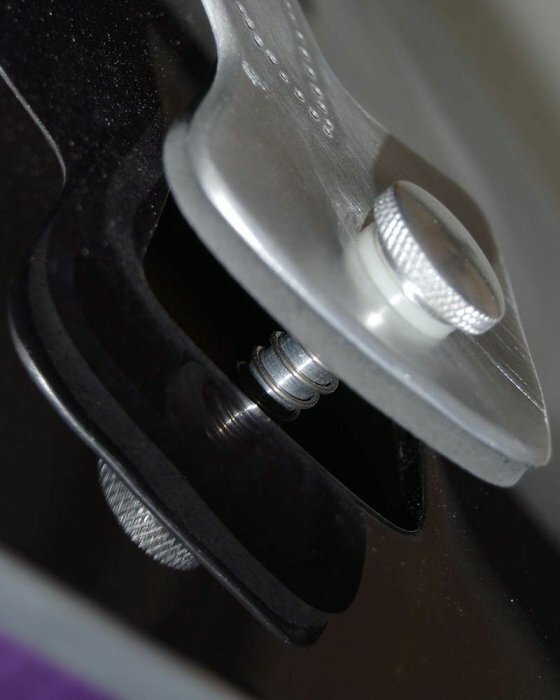 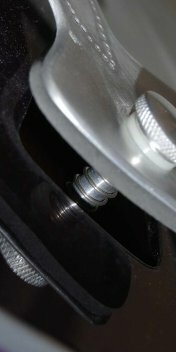 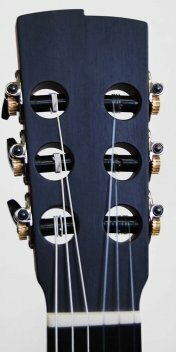 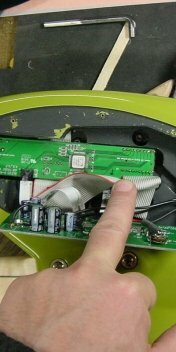 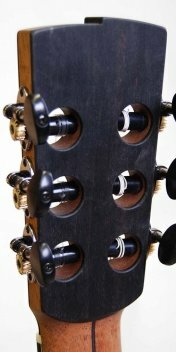 Using integrated thumb-screws, it can be lowered until it completely covers the openings, making the guitar less prone to feedback and also allowing the player to have control over the guitar’s bass frequencies. 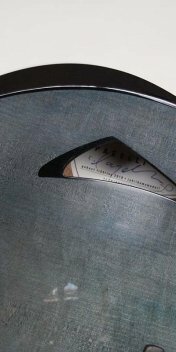 Of course the guitar’s aluminum binding is also special, but I stole that idea from Tim Teel. 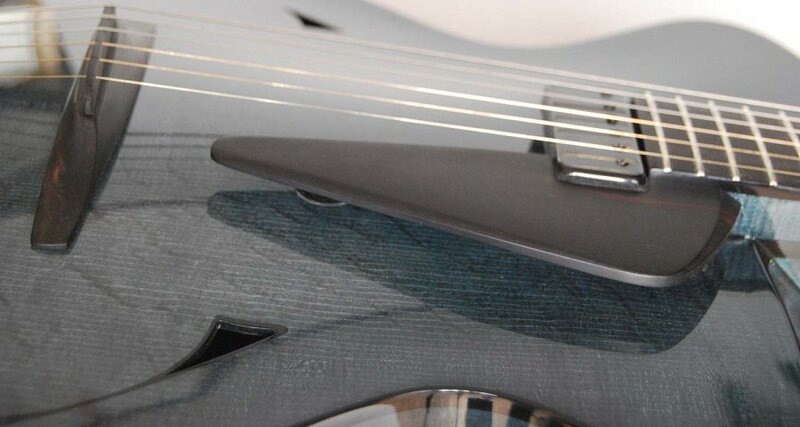 Given how many of the guitar’s other parts were already made out of aluminum, it just had to be part of it. 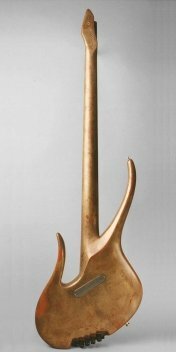 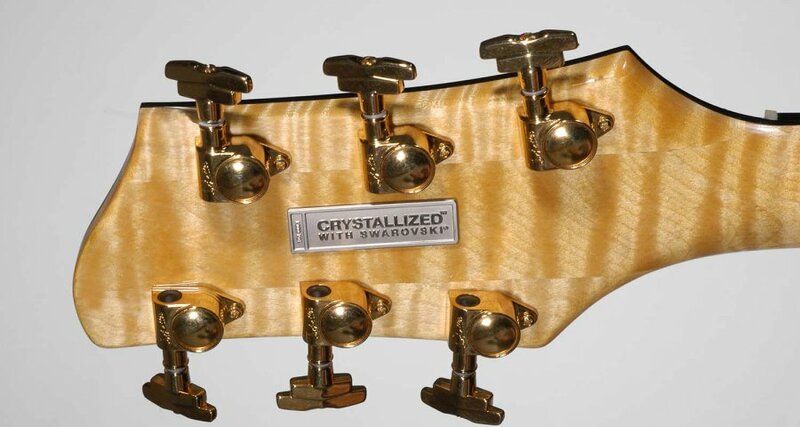 Certainly, the world will keep on turning without innovations like these, but isn’t it just nice how the headstock seamlessly flows into the neck? 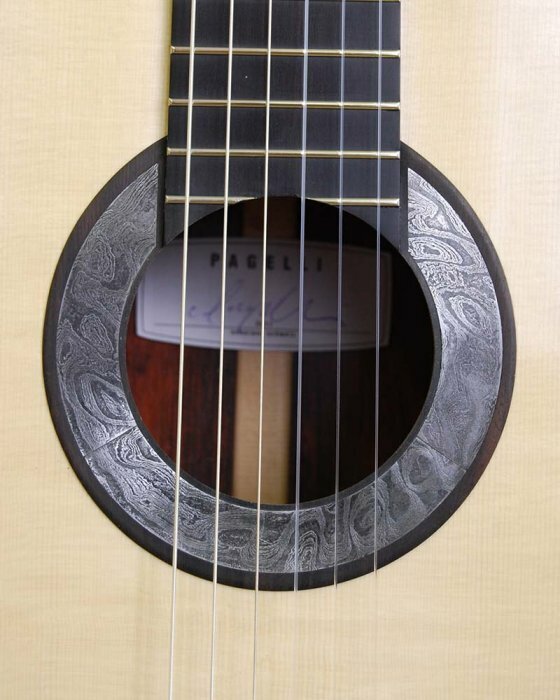 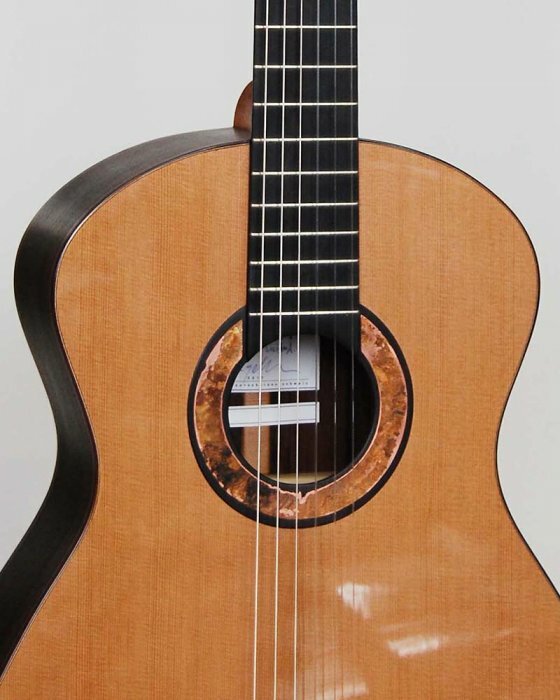 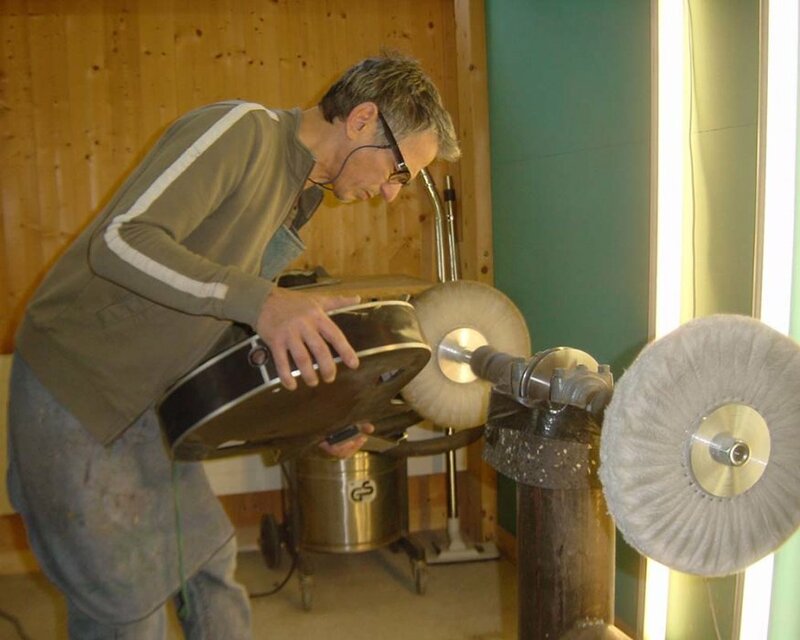 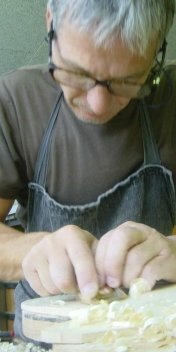 Can you have a rosette made out of folded steel on a classical guitar? 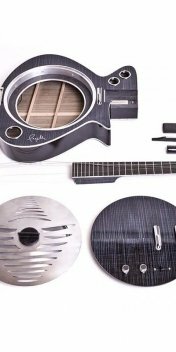 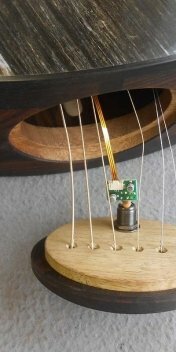 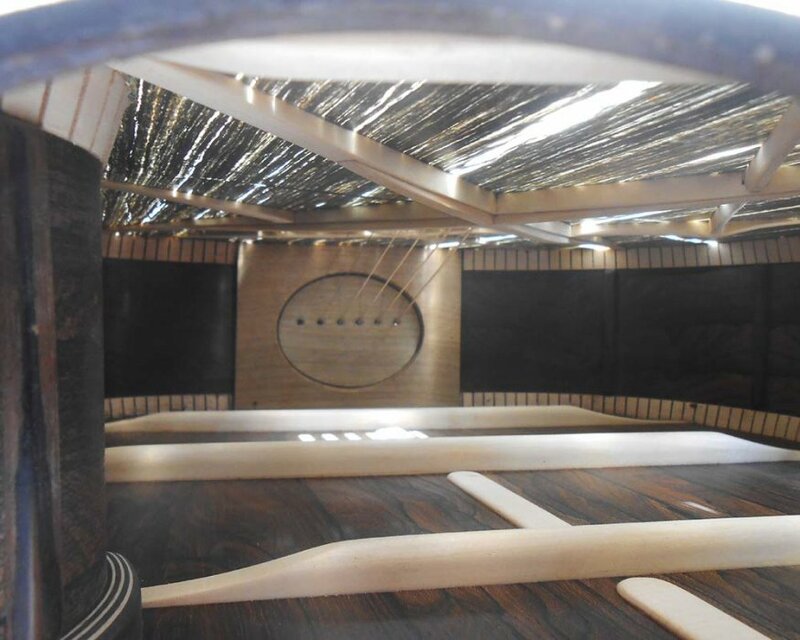 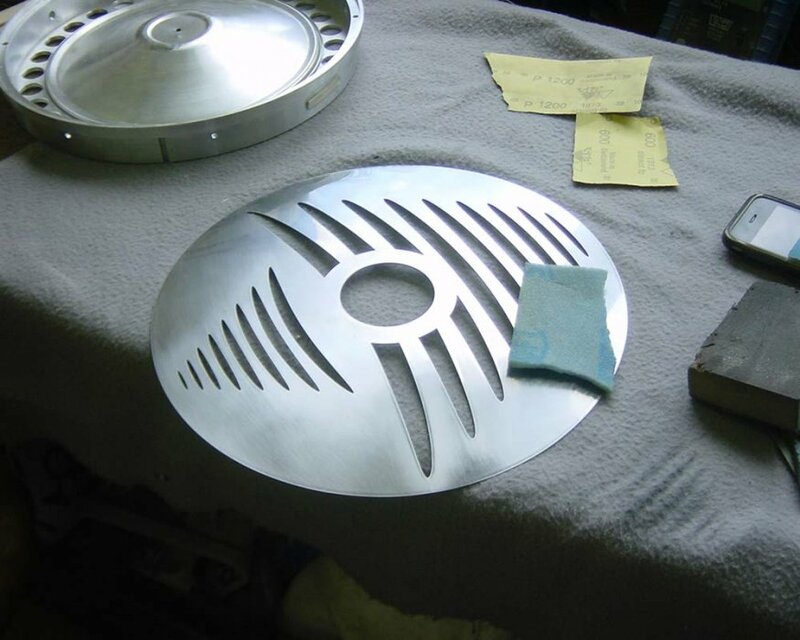 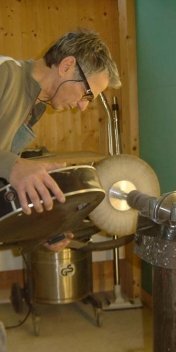 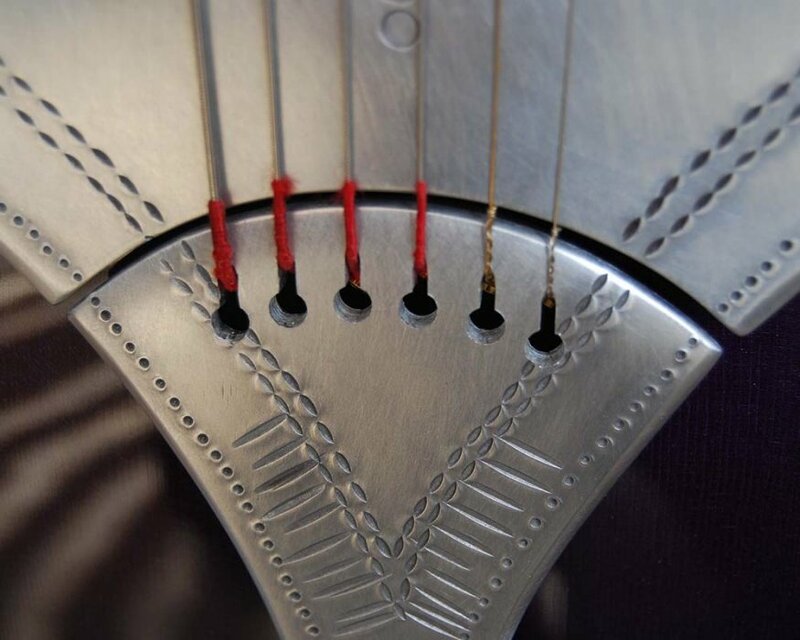 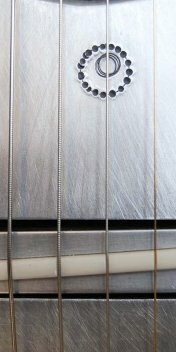 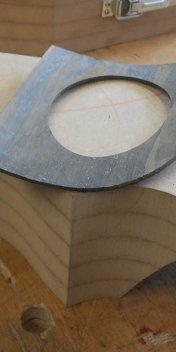 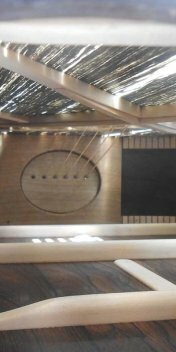 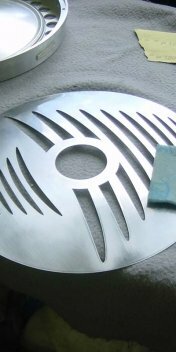 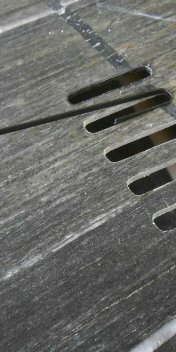 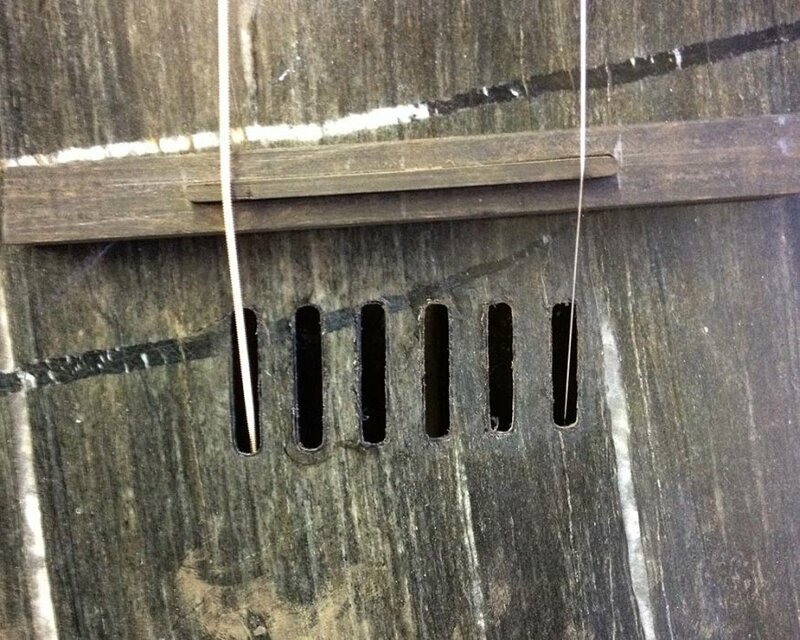 Only if you plan ahead, build the top without the standard reinforcement on the inside of the soundhole area, and work the steel itself to a thickness of only .03 mm, making it light as a feather! 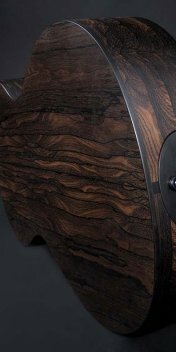 The result is an innovative rosette that only nods to tradition. 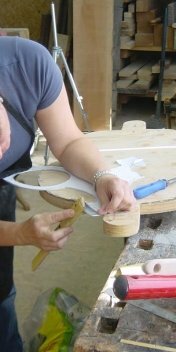 As a matter of fact, it’s also possible to use stone, copper, or other materials - it’s ok for a rosette to break through boundaries! 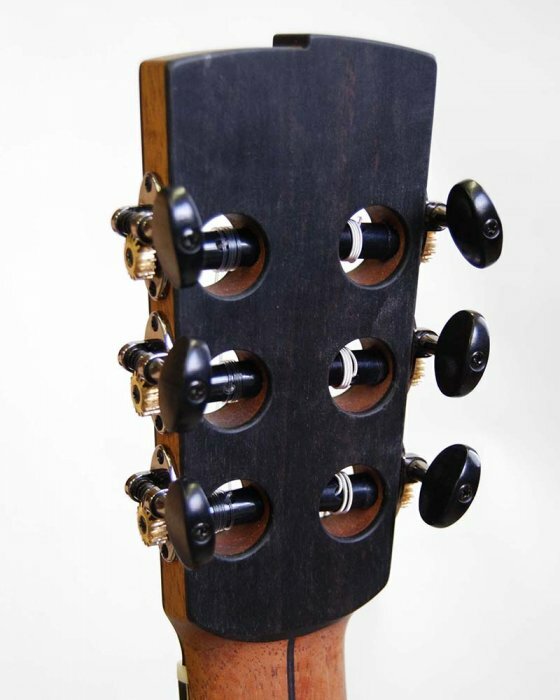 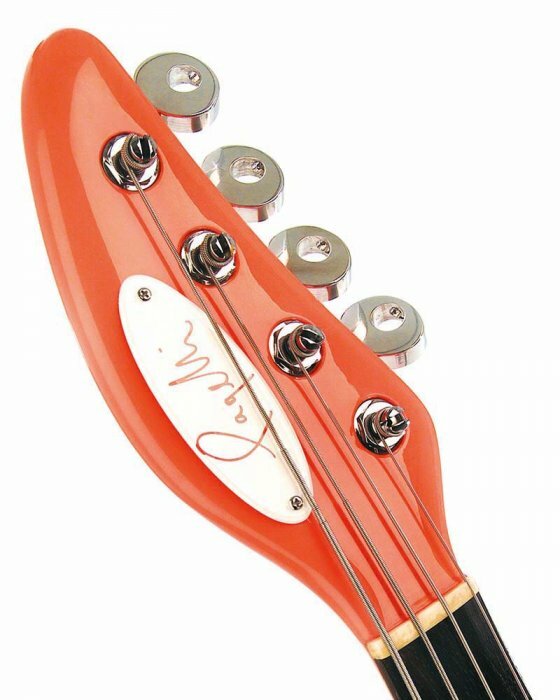 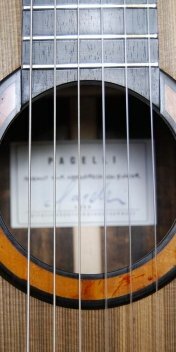 Similarly, who says that a classical headstock has to be slotted? 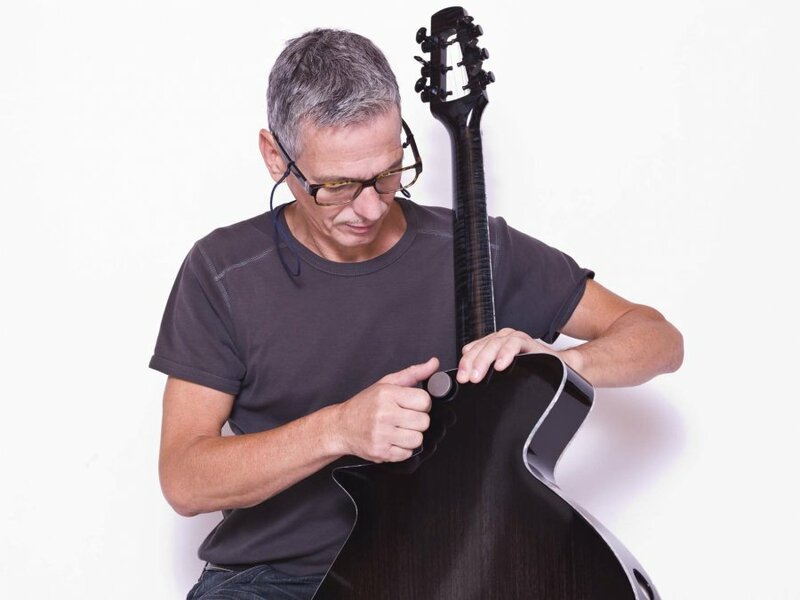 In the case of our Massari archtop, the innovative qualities of a combination of carefully considered features are greater than the sum of their parts. 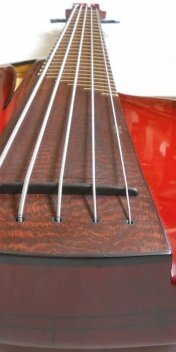 First, there’s the wood-on-wood tailpiece design, similar to those found on viola de gambas, which we feel offers the most honest and direct transmission of the strings’ sound. 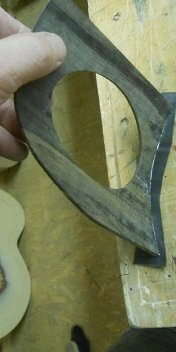 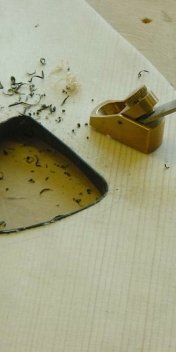 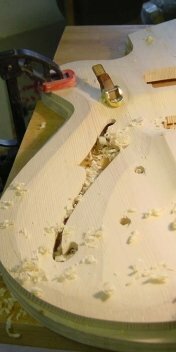 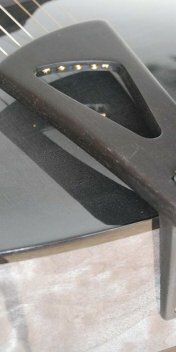 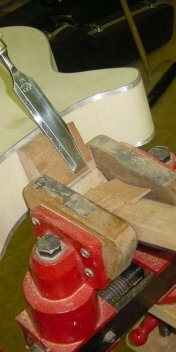 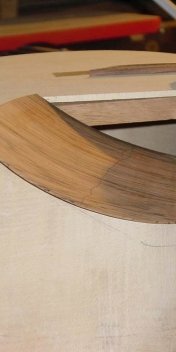 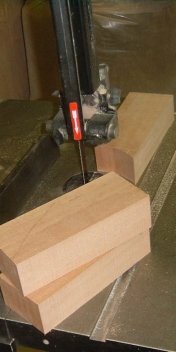 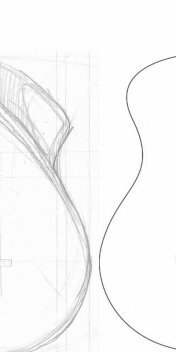 Then there is the bevel that takes the place of a cutaway, and of course our reversed finger rest, which we now use on all our archtops. 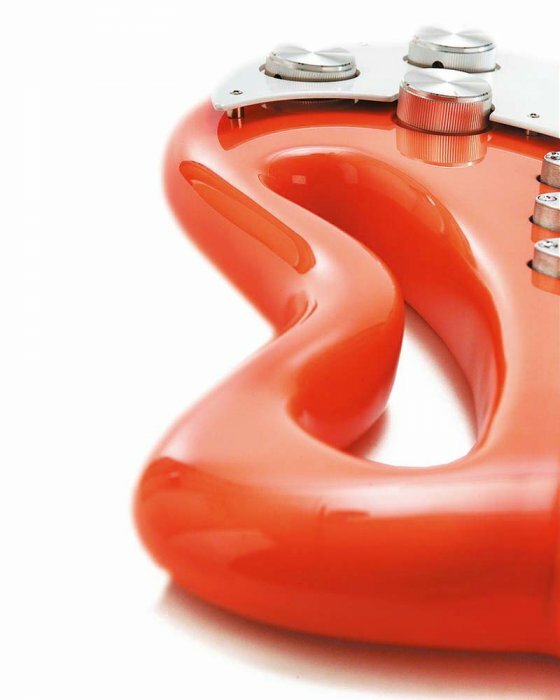 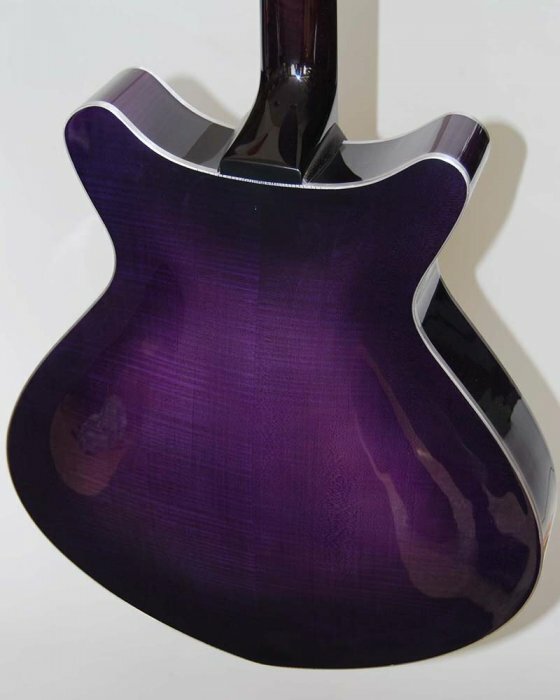 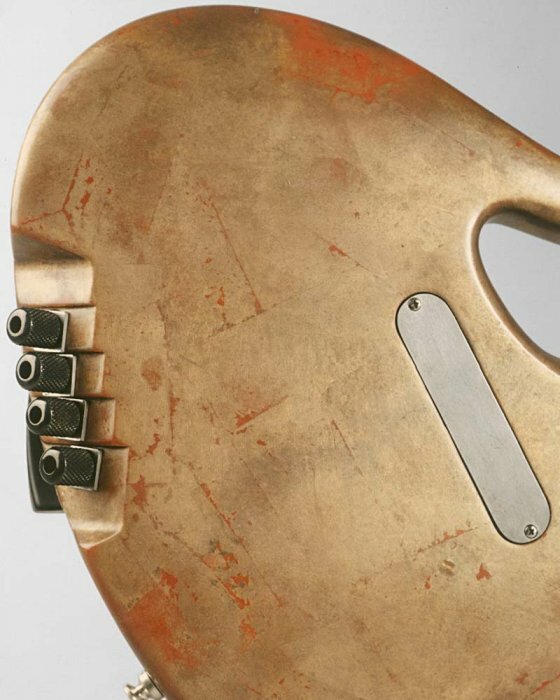 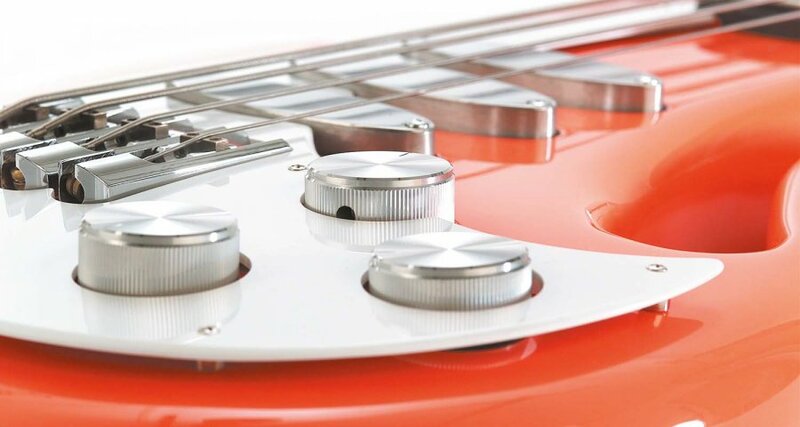 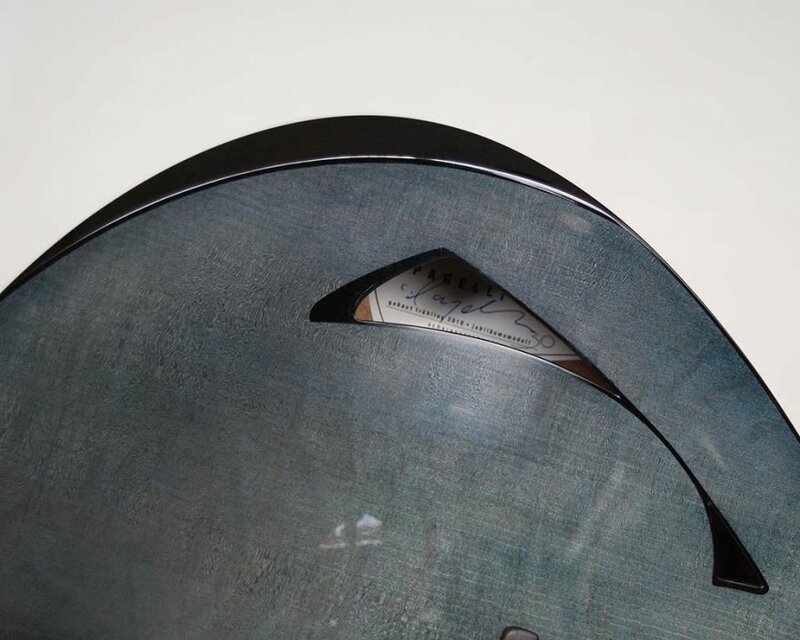 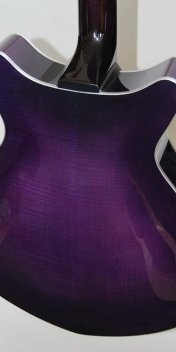 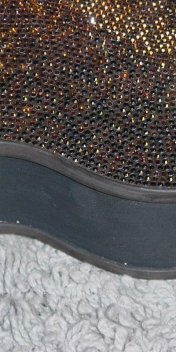 Traditionally, the pickguard, which is really more of a finger rest for most modern players, was shaped in a way that partially covered the treble-side f-hole. 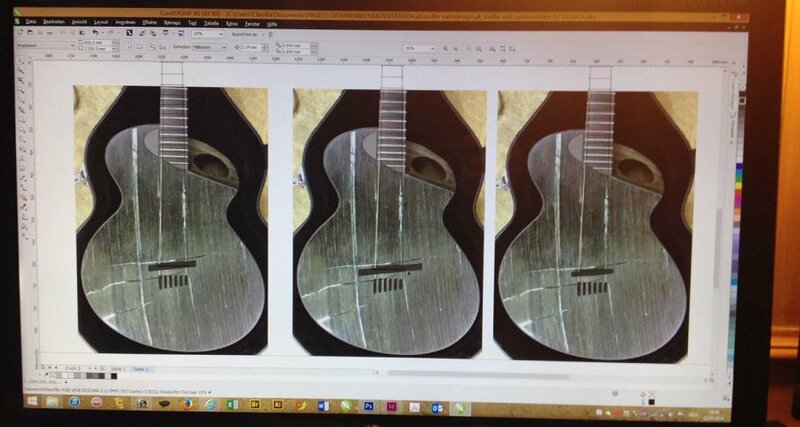 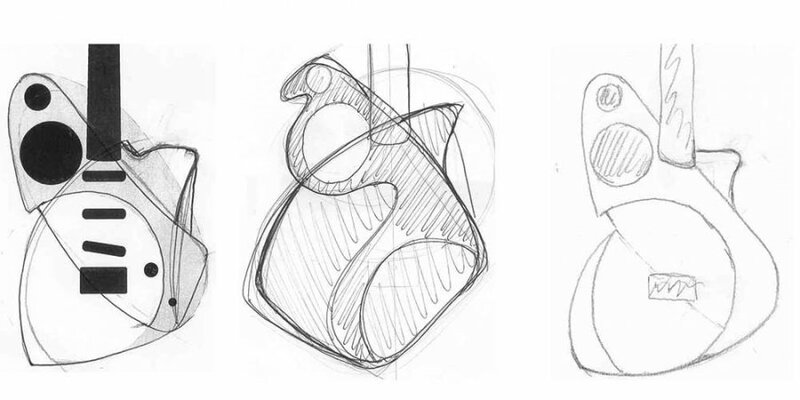 We solved the problem by turning the shape around, which also corresponds with the appearance of the tailpiece. 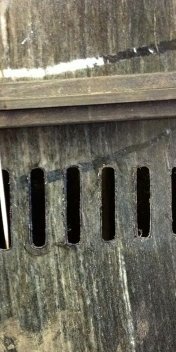 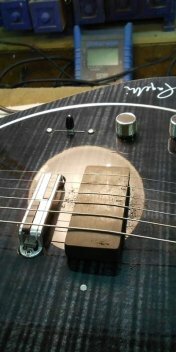 Also worth noting are the ebony-bound f-holes, as well as the solid bridge, which offers a large contact surface to the top, leading to a huge improvement in tone. 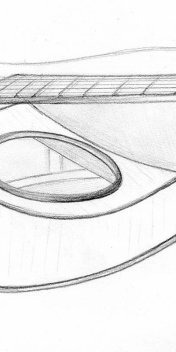 Again, it’s in the way of how features are combined that leads to an innovative concept. 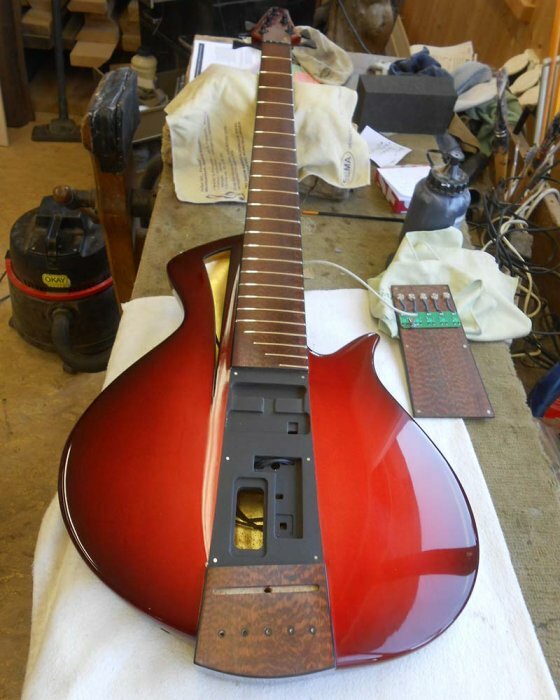 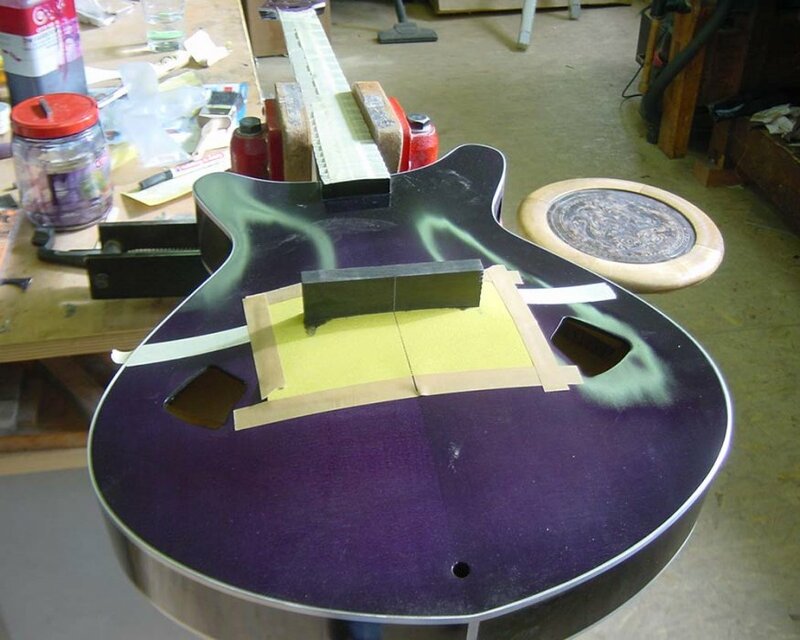 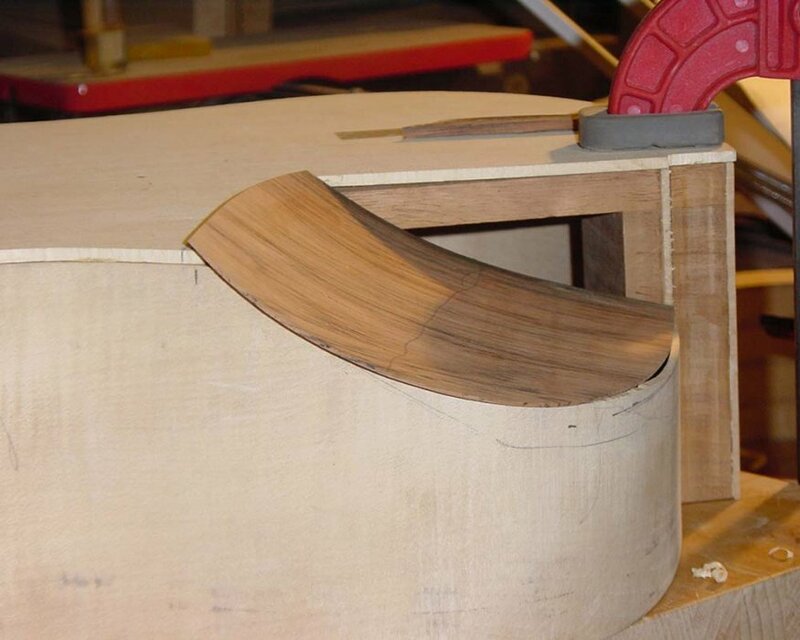 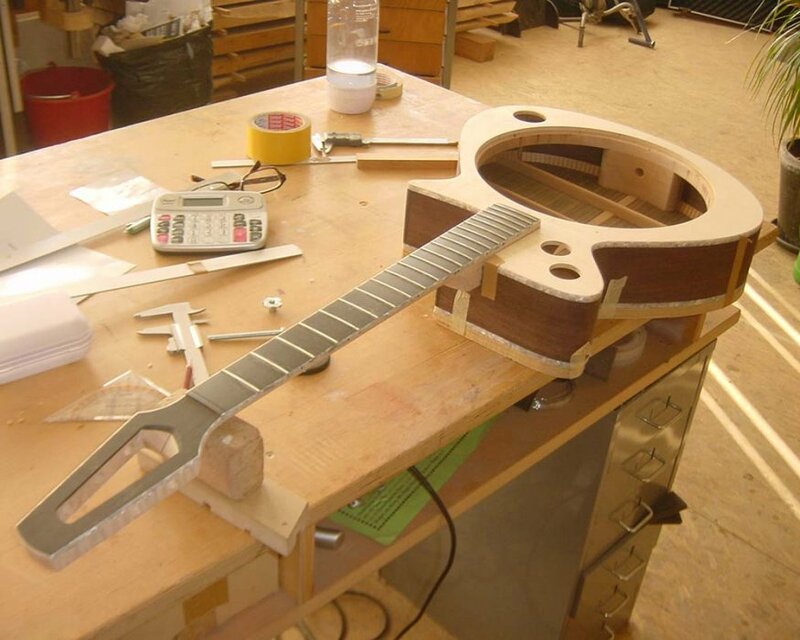 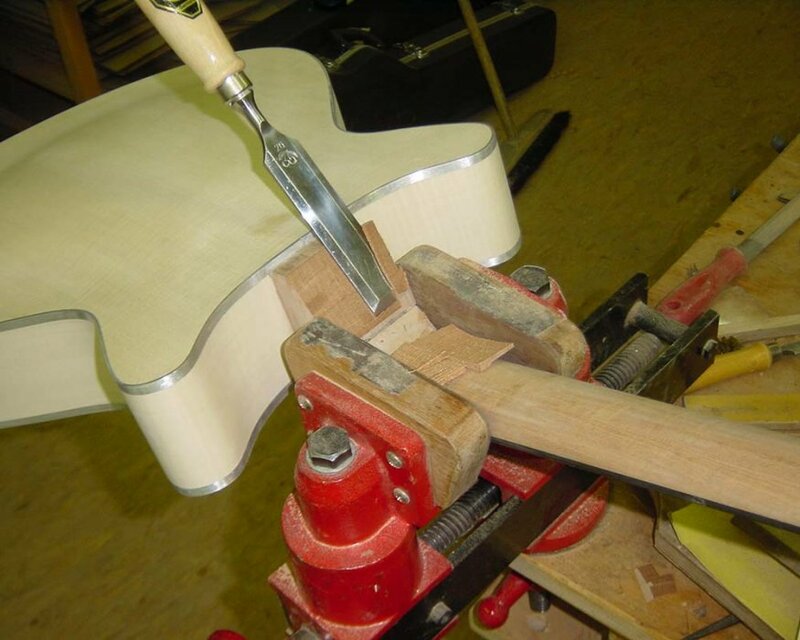 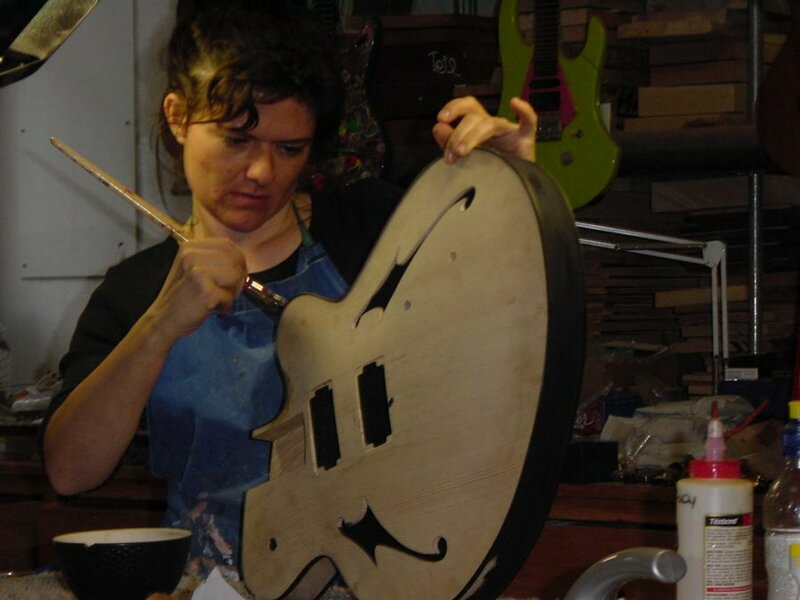 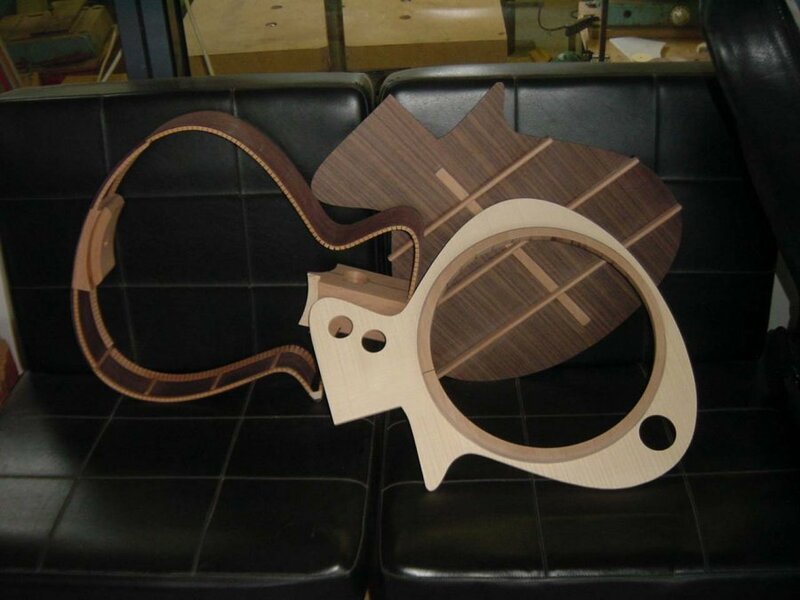 This is where we first introduced the Top Cut with the integrated soundhole. 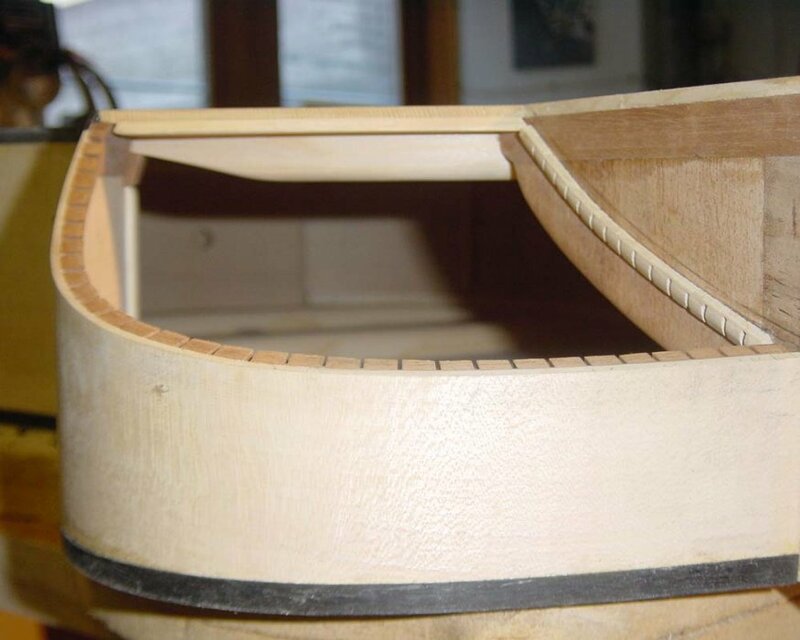 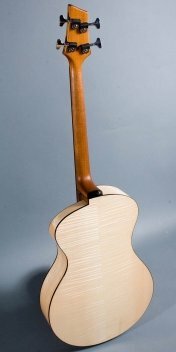 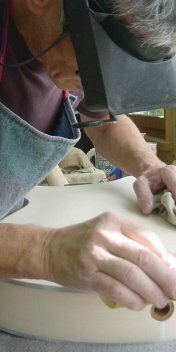 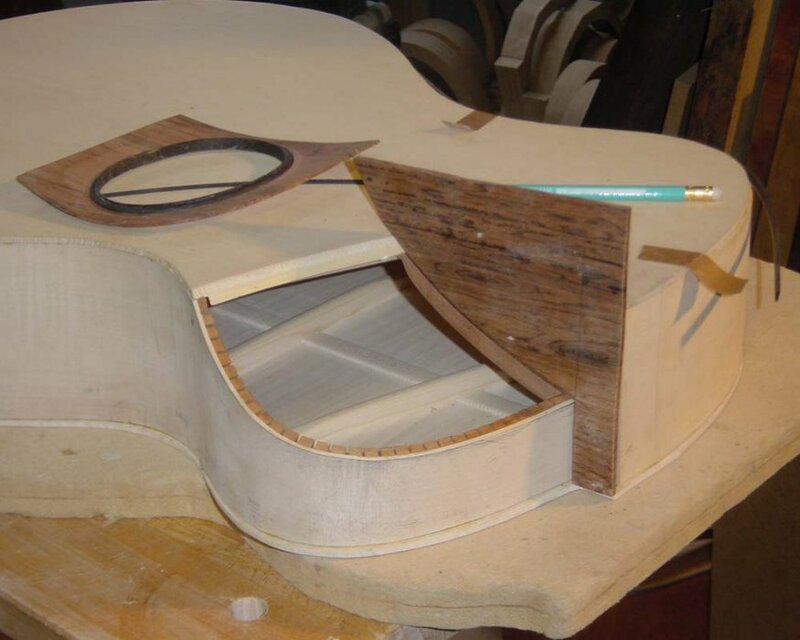 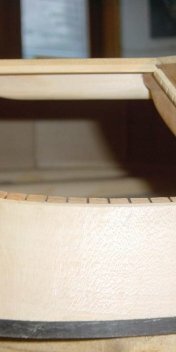 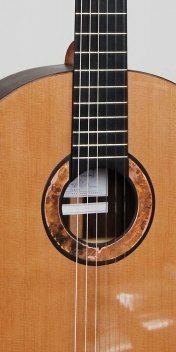 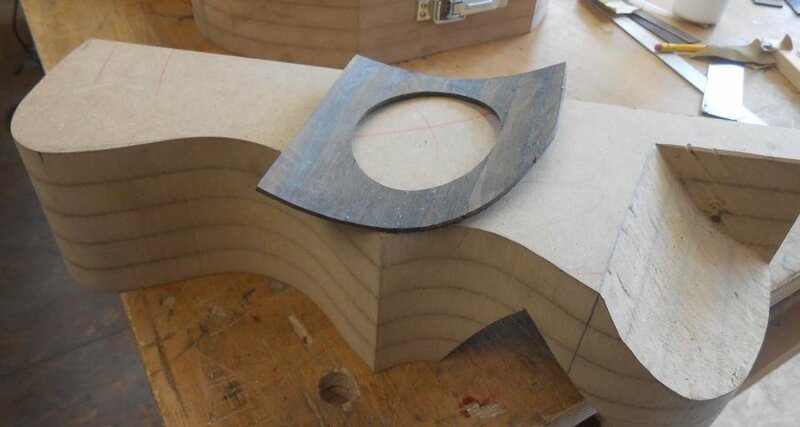 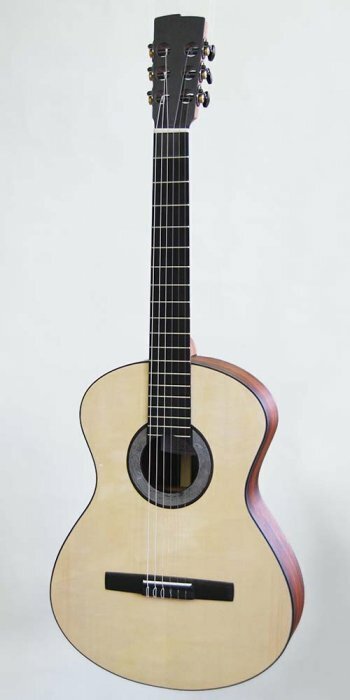 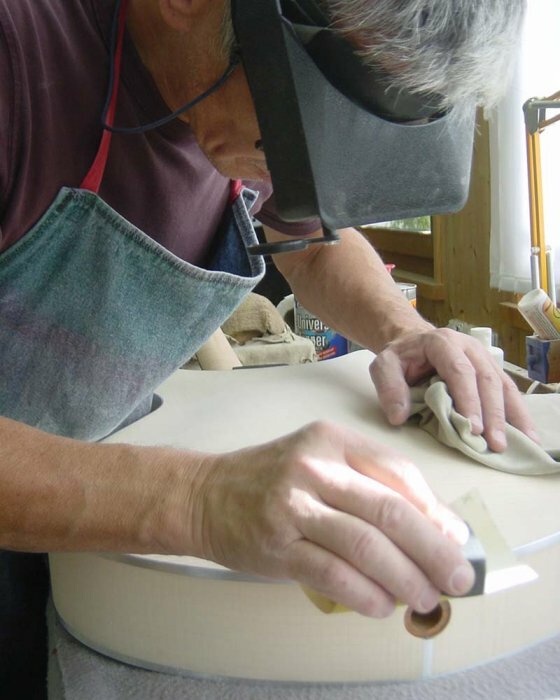 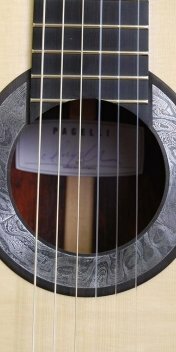 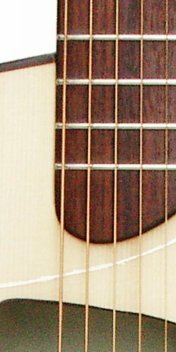 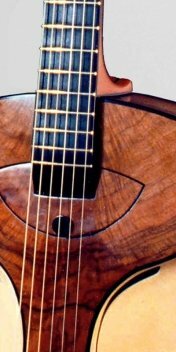 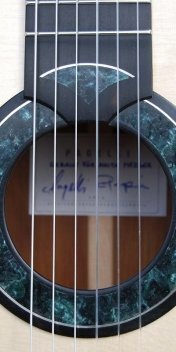 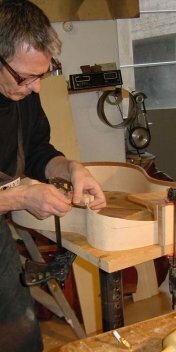 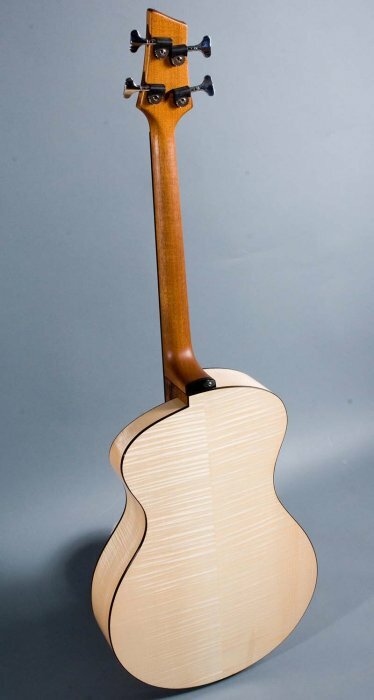 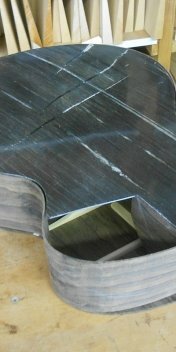 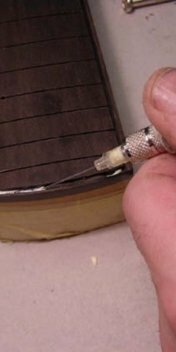 Wanting to maximize the top’s surface in order to move as much air as possible meant moving the soundhole to the edge. 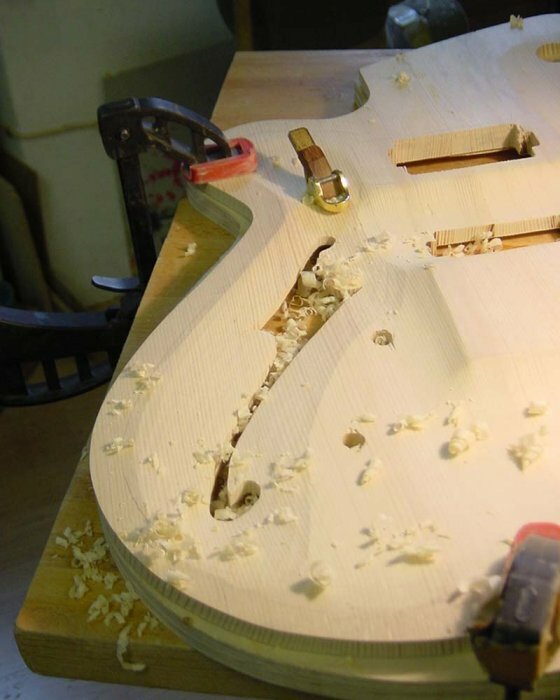 But the customer had requested a cutaway, which of course literally takes the bottom out of a section of the body. 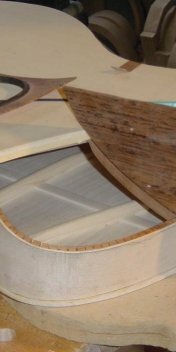 As a solution, we invented the Top Cut, which slopes down the treble side of the upper bout without sacrificing a section of the back. 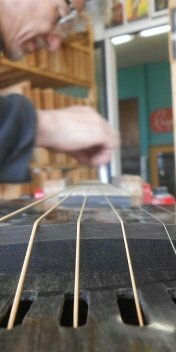 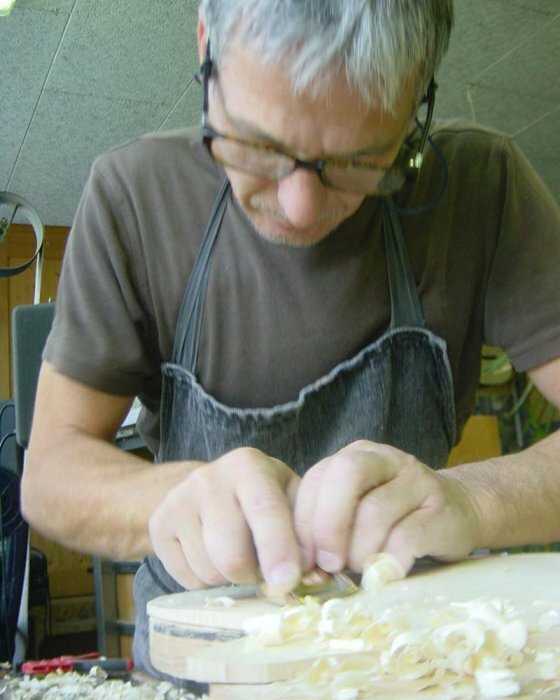 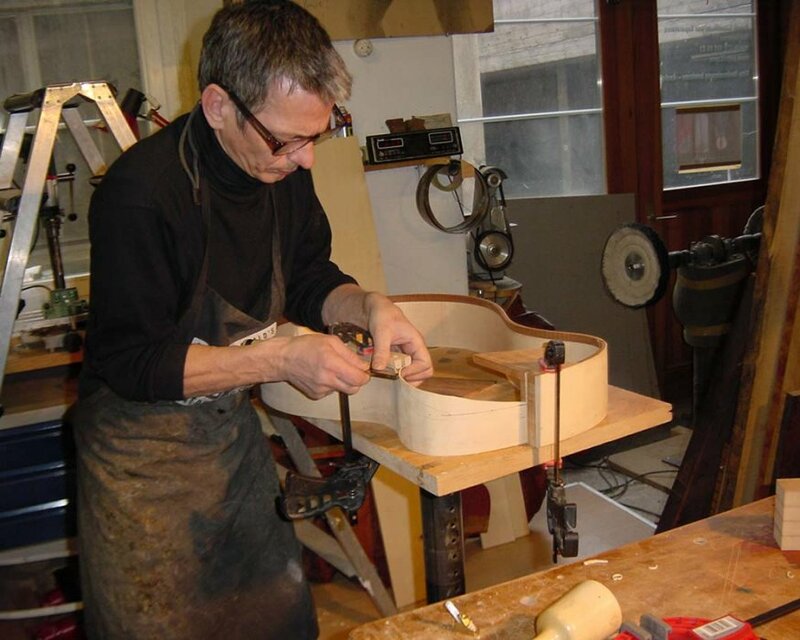 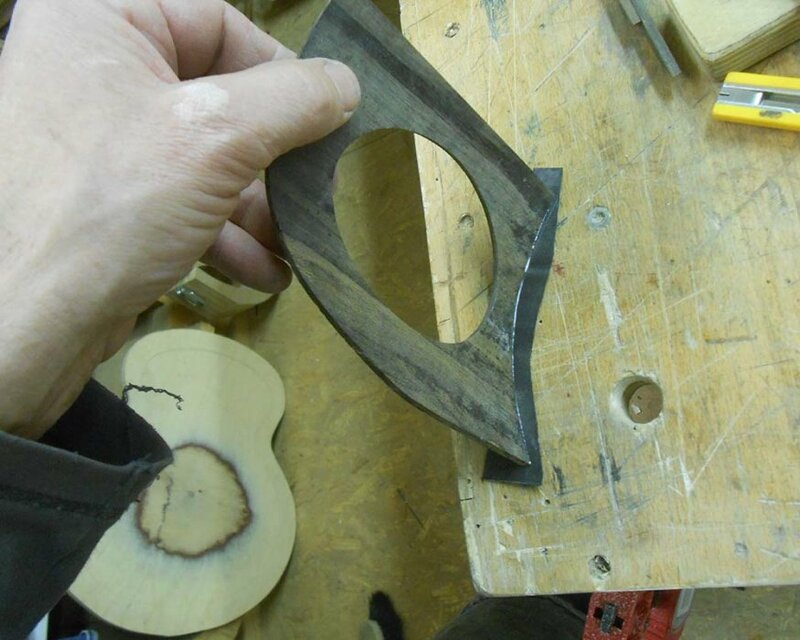 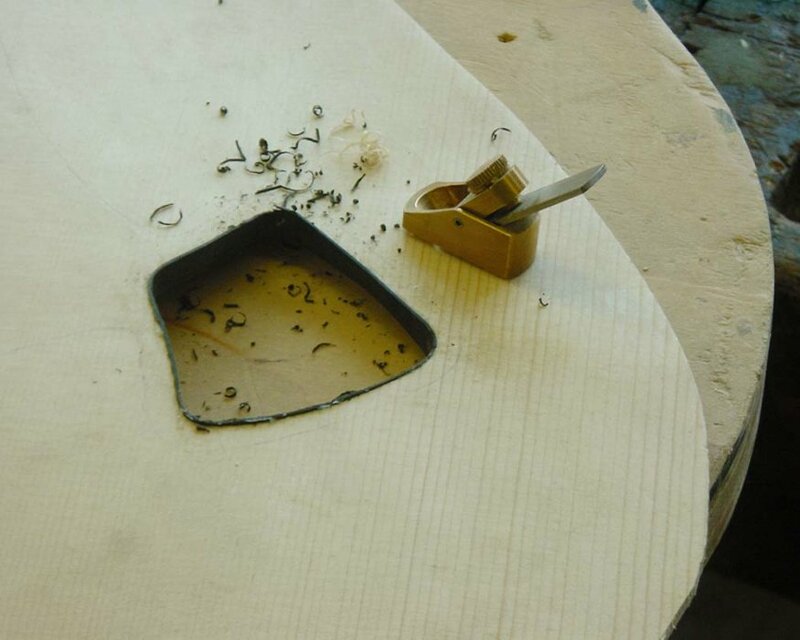 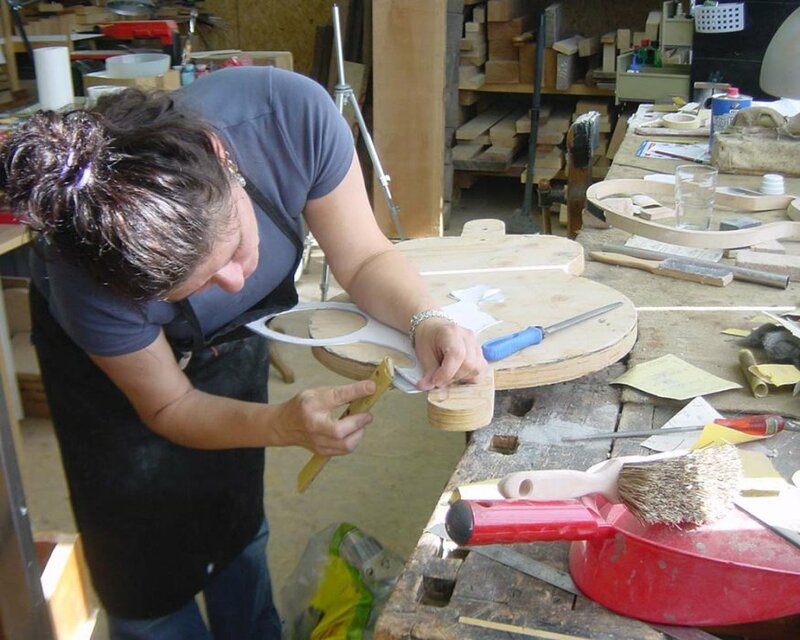 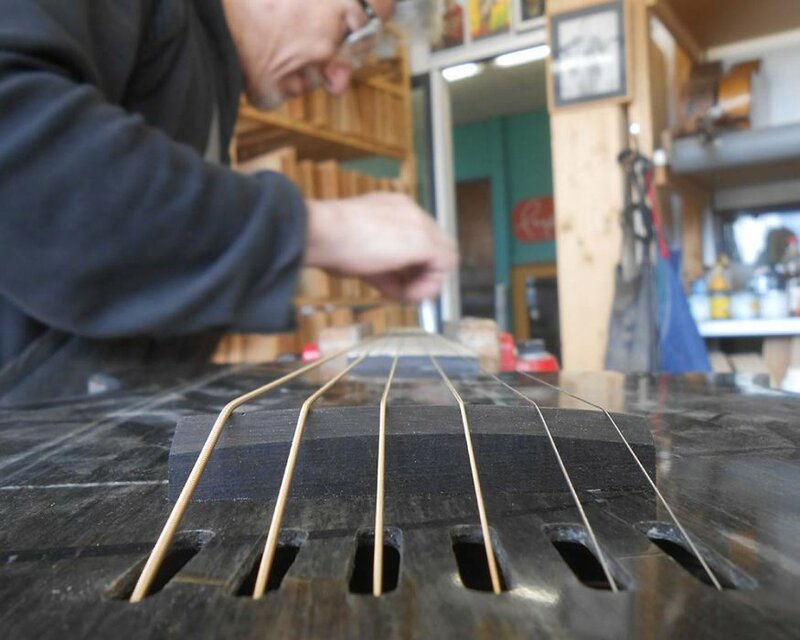 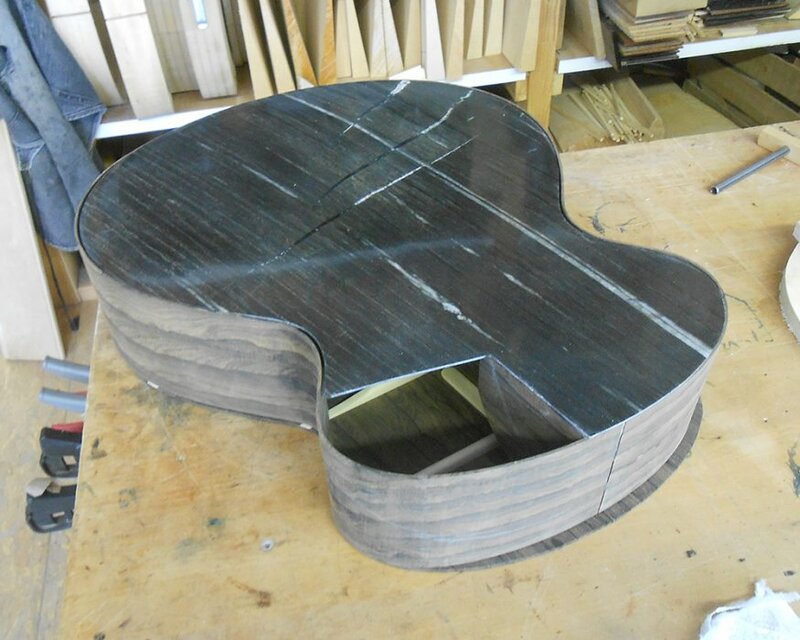 And while we were at it, we decided to use the Top Cut area as a perfect location to move the soundhole to. 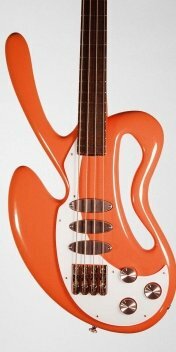 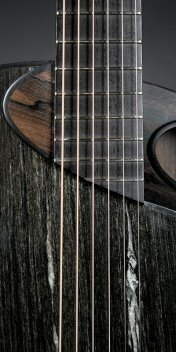 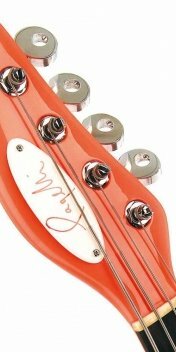 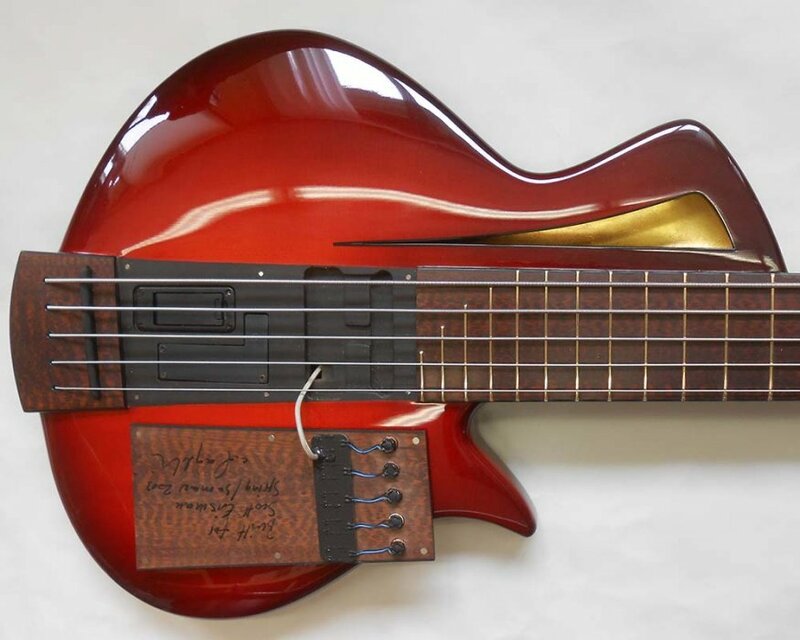 More about this bass in the Custom Made section. 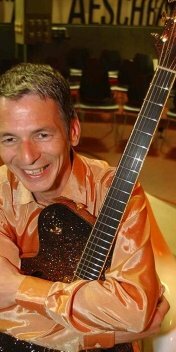 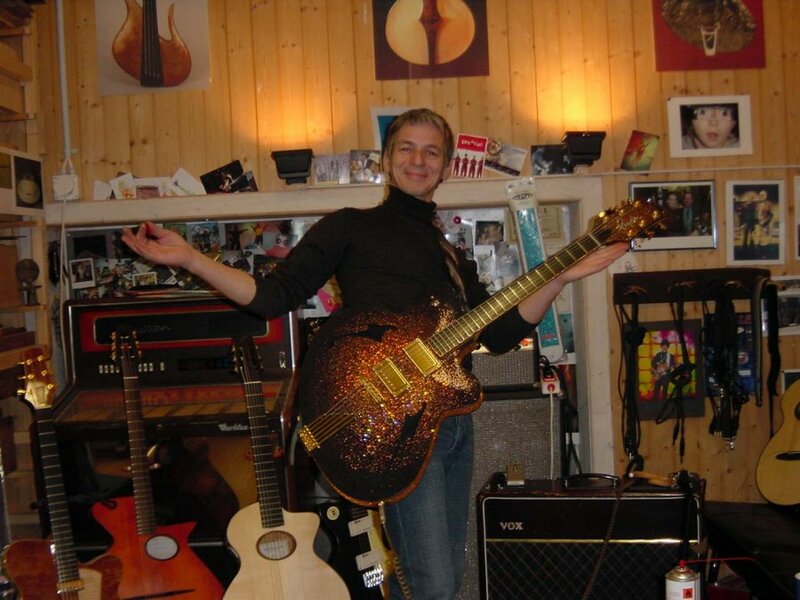 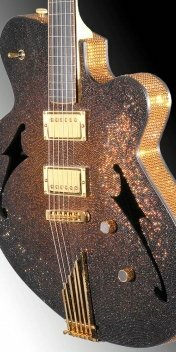 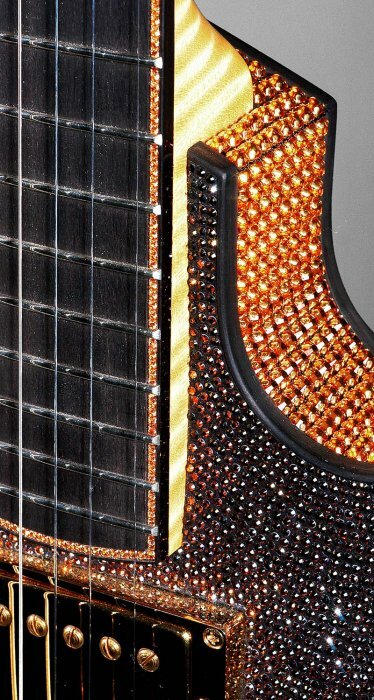 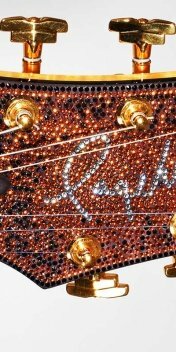 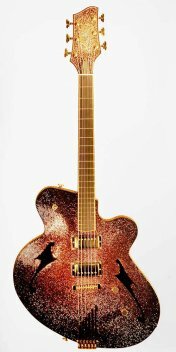 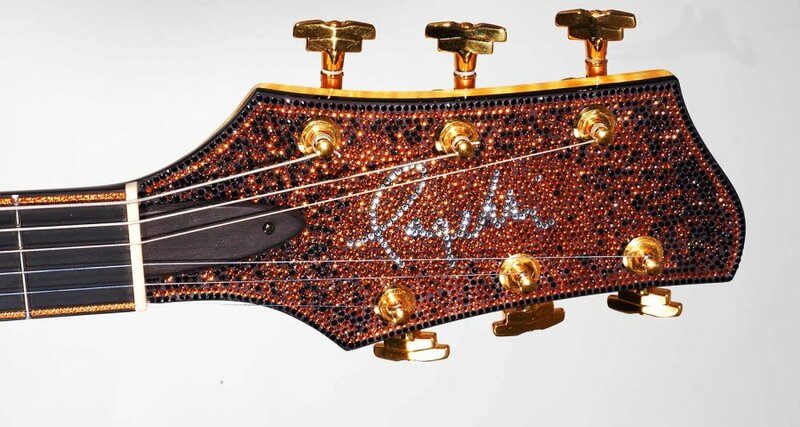 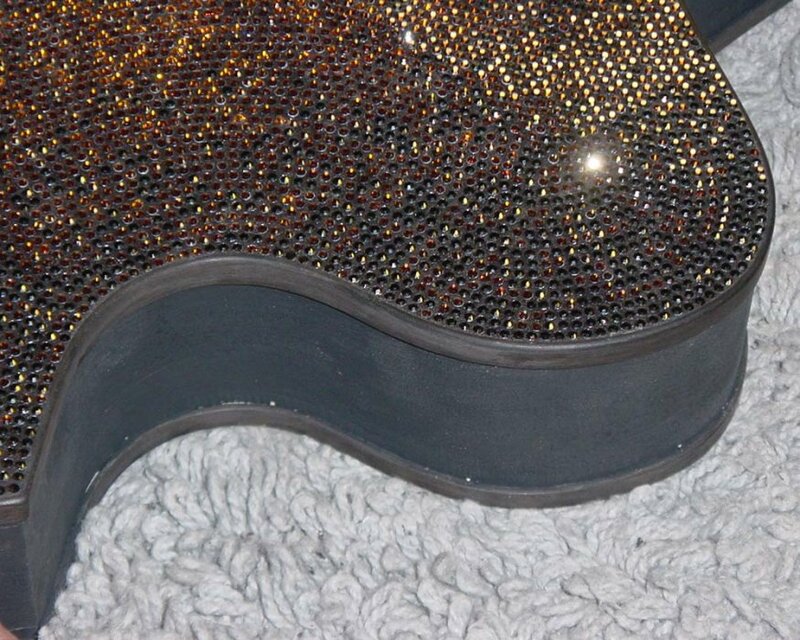 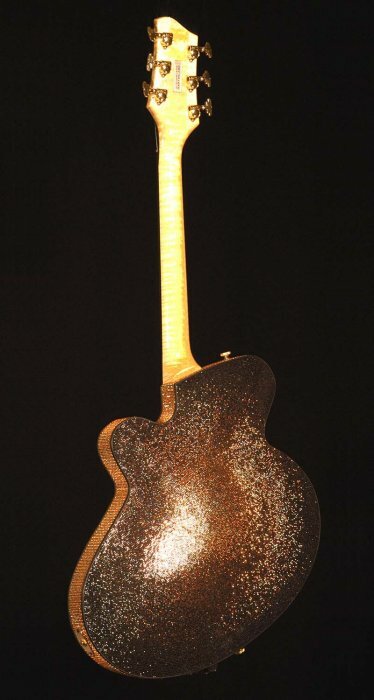 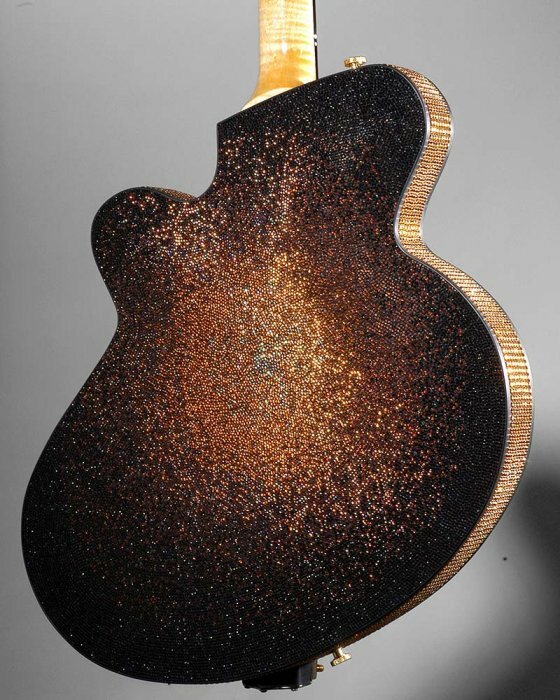 A guitar that’s completely covered in Swarovski crystals, arranged in a sunburst pattern! 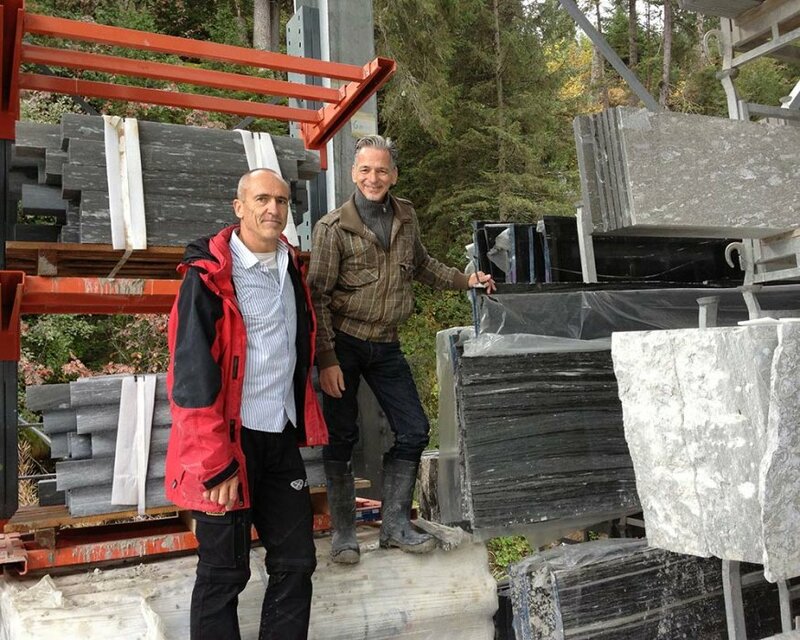 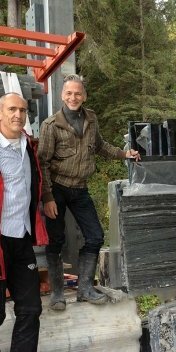 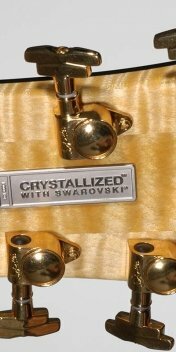 OK, so we looked into who the most renowned maker of high-end crystals was, a search that lead us to Swarovski. 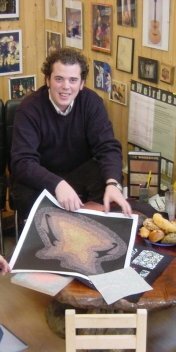 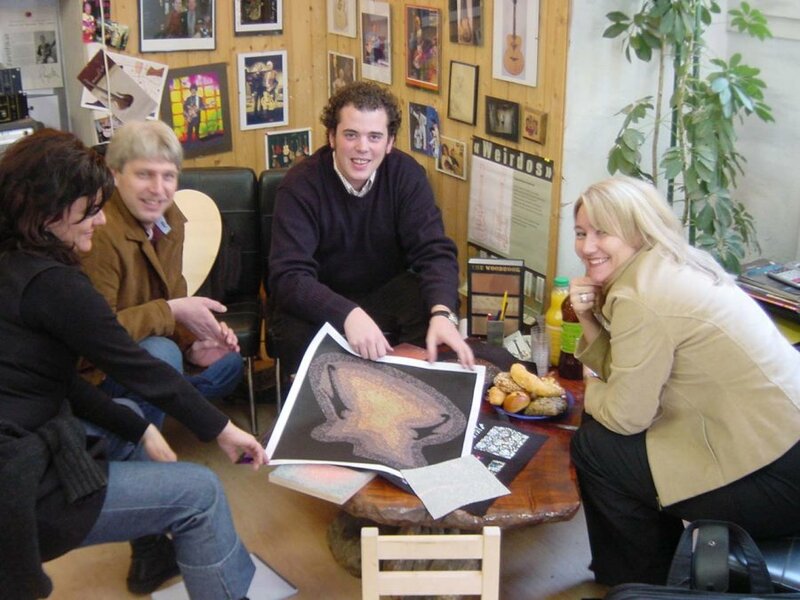 We boldly got in touch, asked our way through several departments until we reached upper management, which turned out to be family, and they were enthusiastic about the idea! 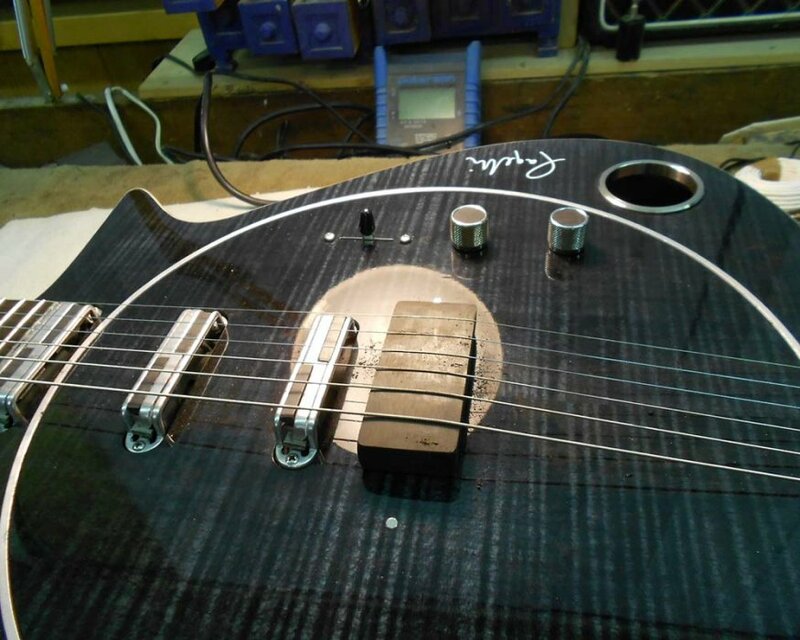 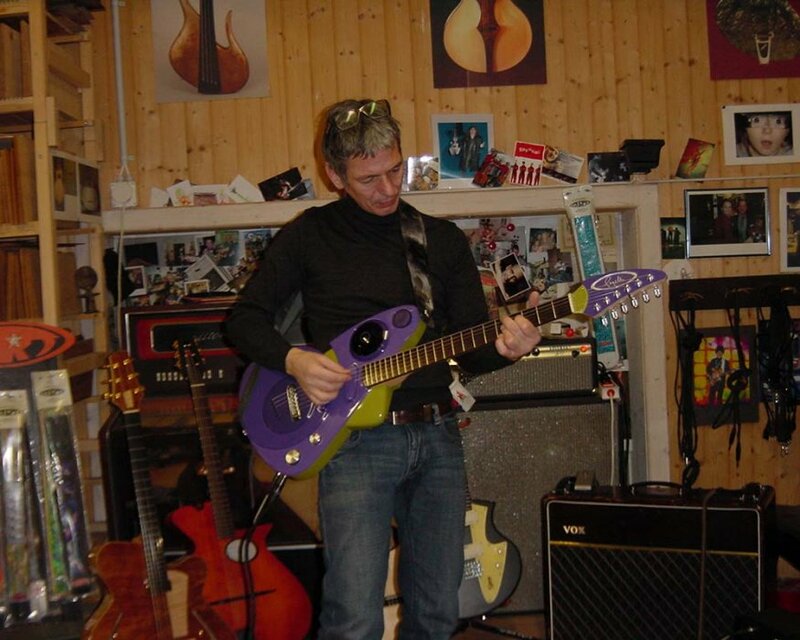 Of course we wanted to build something high-end and innovative, but it also had to captivate guitarists. 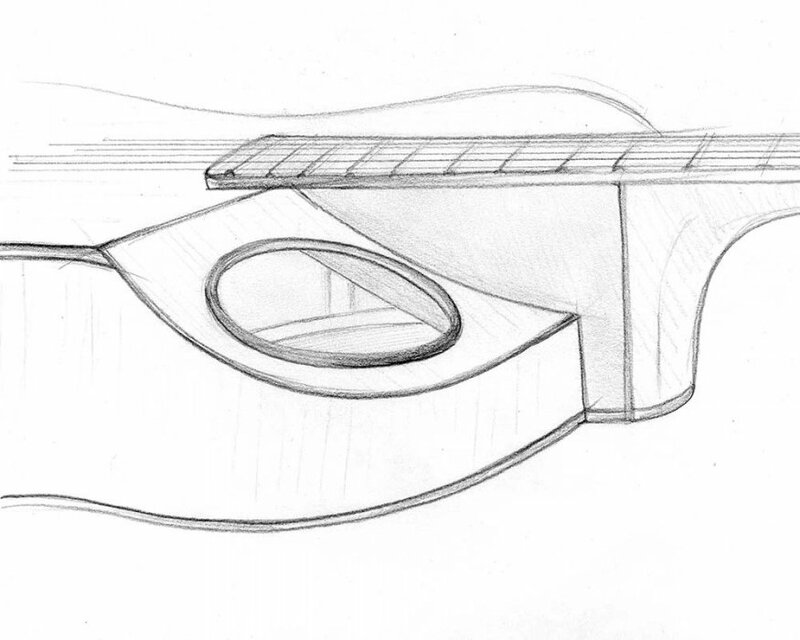 Since the guitar’s shape is already on the unusual side, we thought about the look of a traditional sunburst. 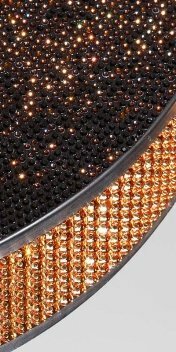 But several attempts to achieve a realistic sunburst-type look while working with Swarovski’s creative department still didn’t yield the desired results, so the company got its programmers to create a new process for producing the right kind of color and reflection. 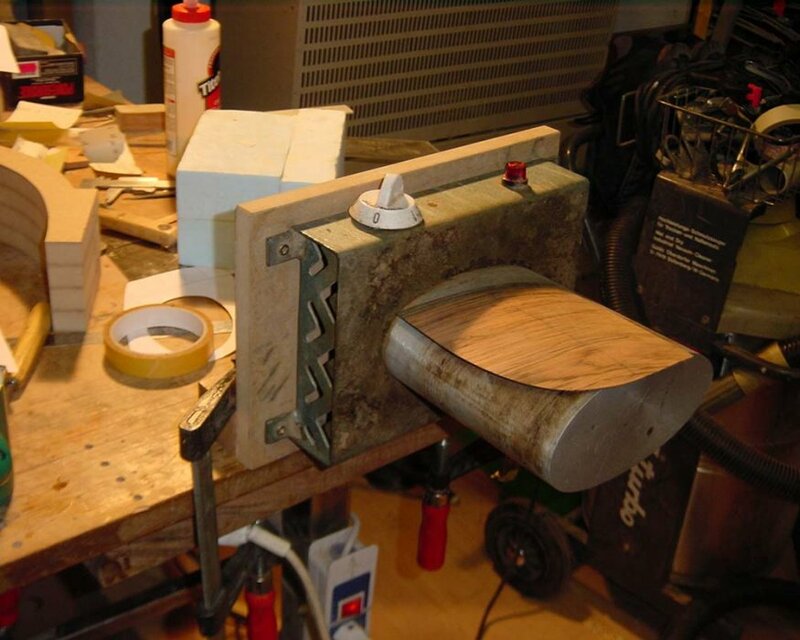 In other word, no effort or expense was spared! 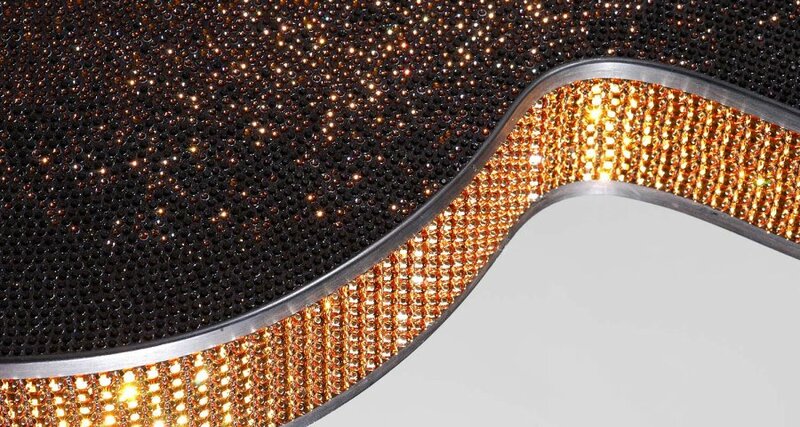 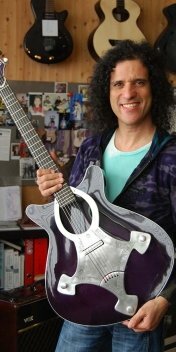 Based on our Jazzability design, the Swarovski Crystal guitar is covered with more than 60,000 crystals, it looks like a million bucks, and it sound amazing - is it because of the crystals? 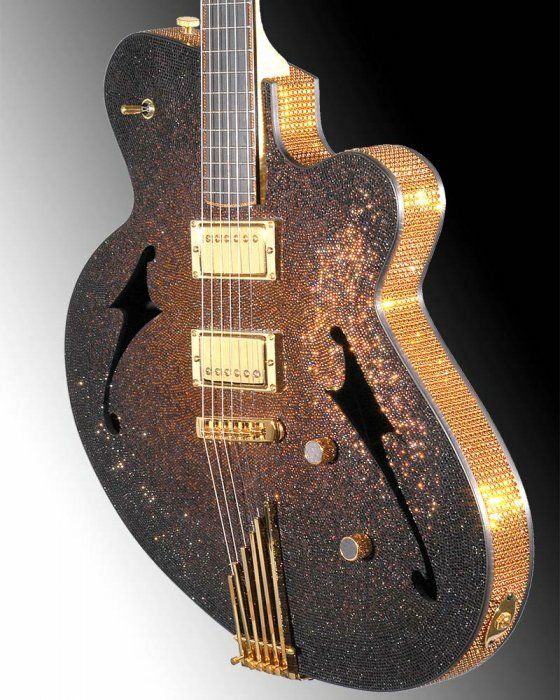 If Liberace had given Elvis a guitar, this is probably what it would have looked like! 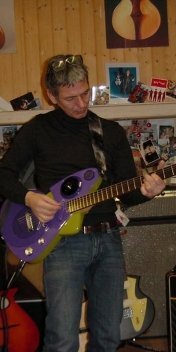 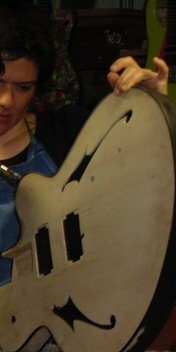 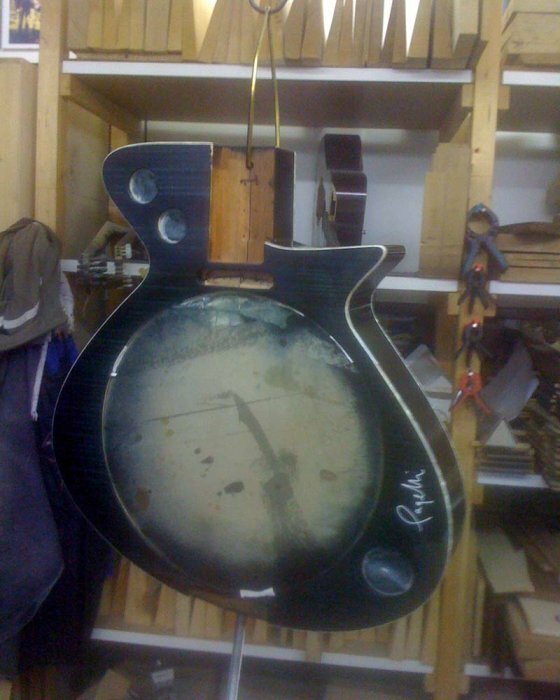 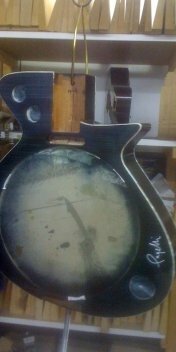 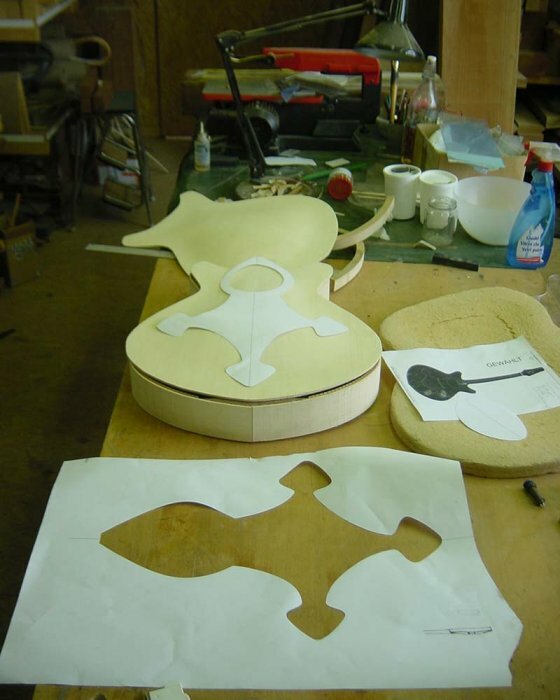 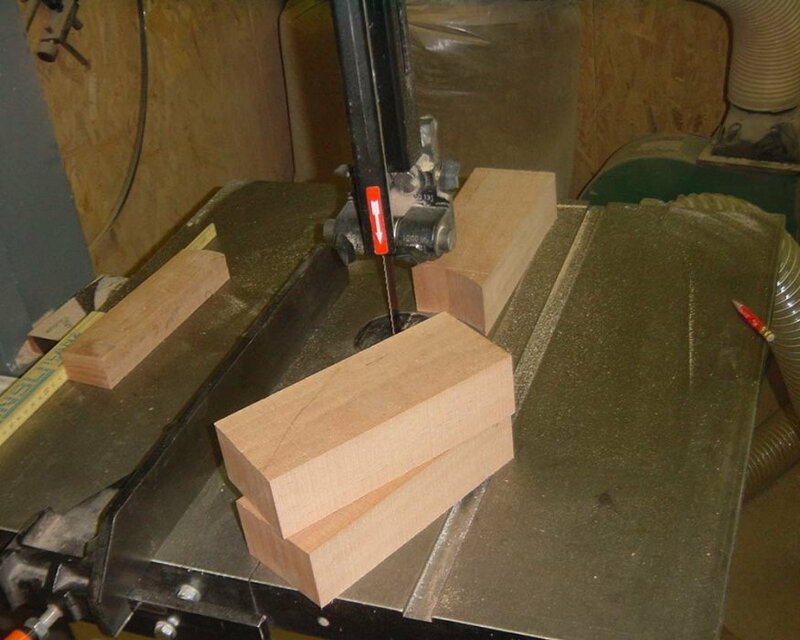 This was out first guitar with shifted proportions. 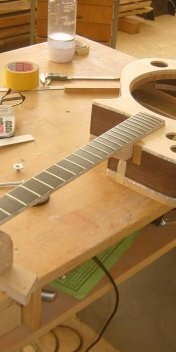 Since building this one, we started doing the asymmetrical shift the other way around, which leads to better access to the higher frets. 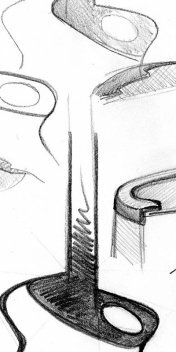 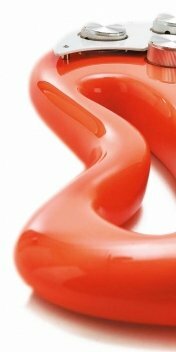 Another new element is the armrest, which is integrated into the design. 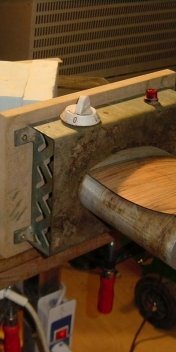 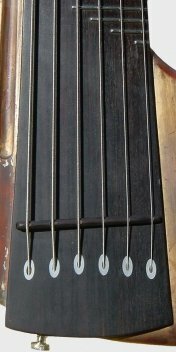 Rather than inhibiting the top’s vibrations by dampening a portion of it, the player’s forearm rests on the wooden section that floats above the top. 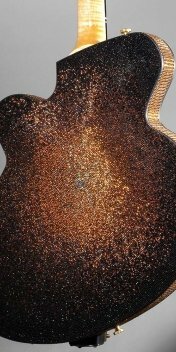 It’s also worth noting that the decorations aren’t painted onto the body, but they’re inlayed using ebony, dyed woods, and silver. 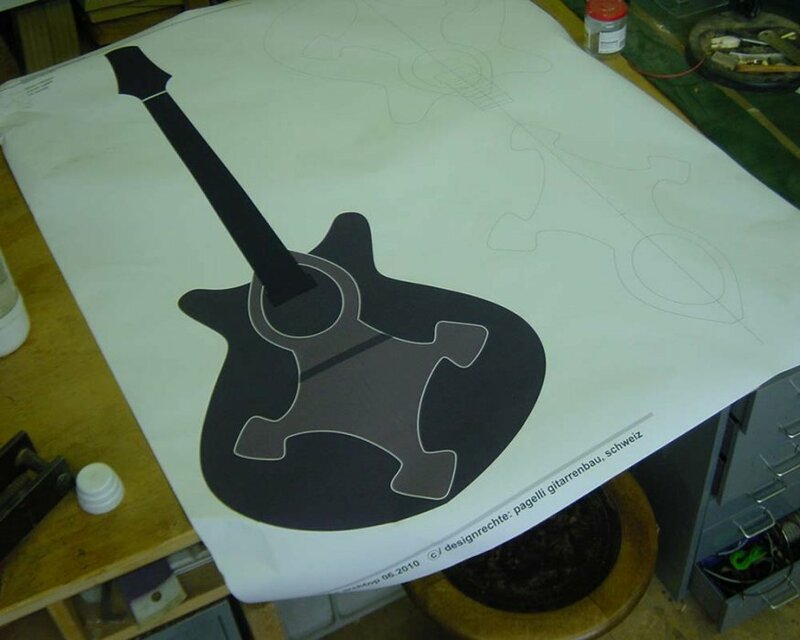 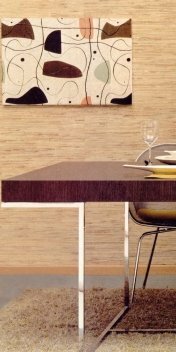 We found the inspiration for the guitar in some wallpaper from the 1950s! 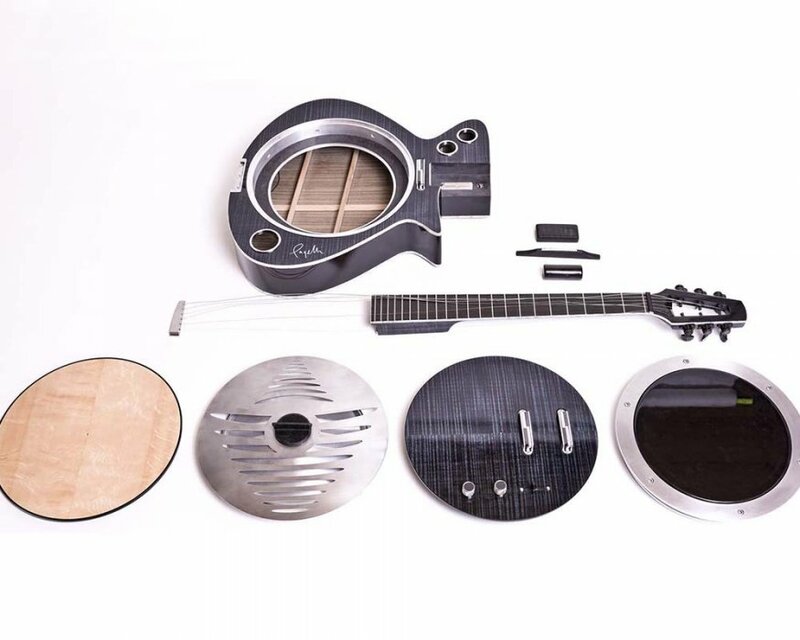 Even though it was conceived for DJ’s, we always thought that it would be amazing to have an Alesis Airfx processor built right into a guitar, where it could be used to controls its sounds. 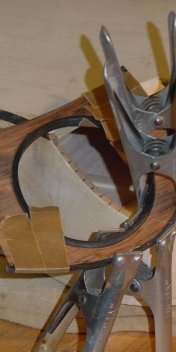 But we wouldn’t have been able to say whether doing so made any sense at all or was merely a gimmick until we actually built the instrument. 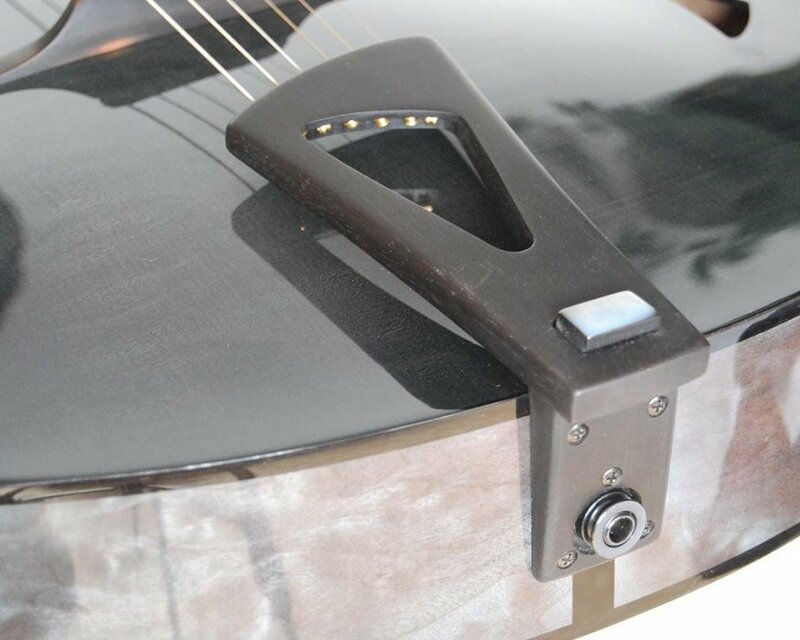 But wow, it really works, is tons of fun, and delivers unheard-of possibilities. 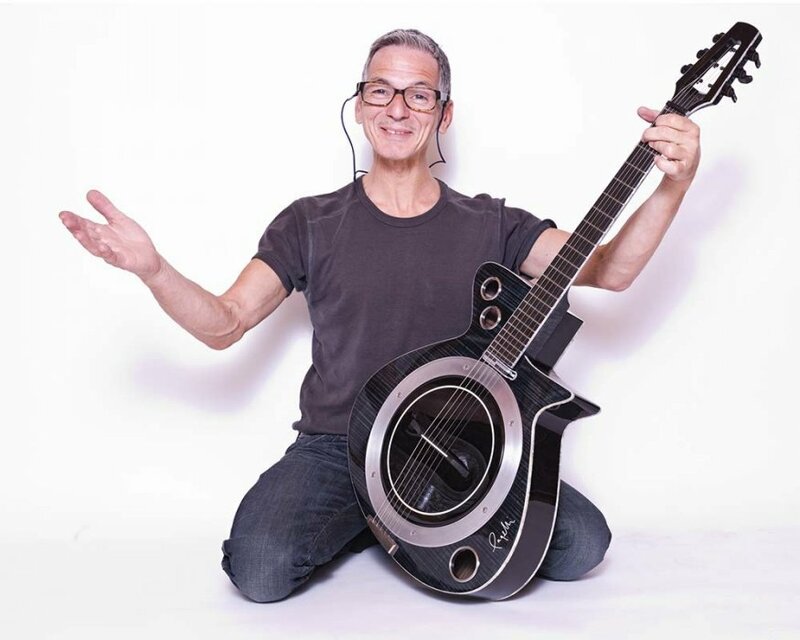 Originally, we thought that only avant-garde players would find any application for this concept, but guitarists in all styles have now shown us that it offers more possibilities than we ever thought of! 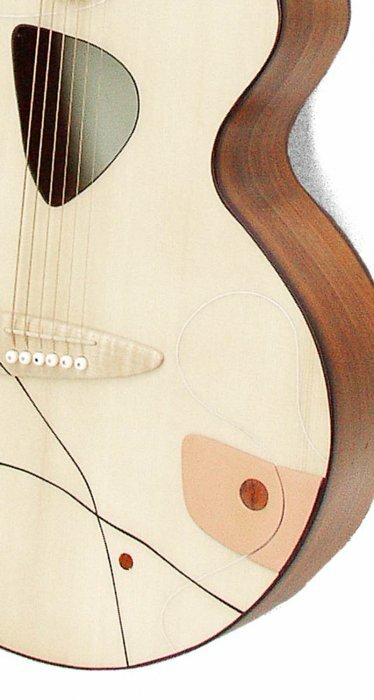 Naturally, we tried to match the guitar’s design with the sound that we thought it would create. 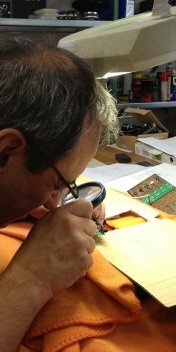 Nothing really innovative here - just goofy all around! 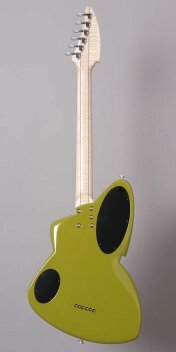 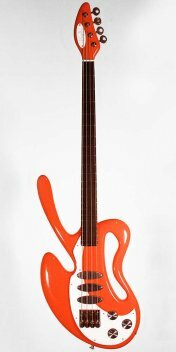 Even though we’ve only built two of these basses (and those aren’t even identical), this is one of our most famous designs. 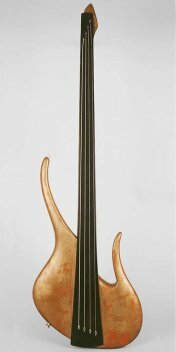 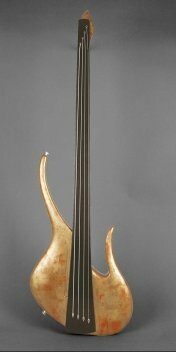 As such, the Golden Fretless bass has been featured in magazines around the world, and it has left a mark on the work of many other builders as well. 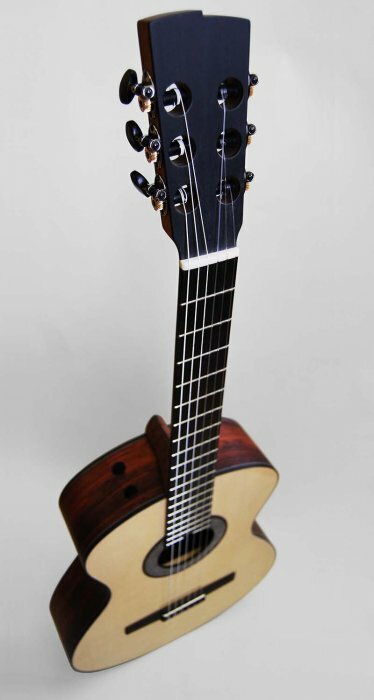 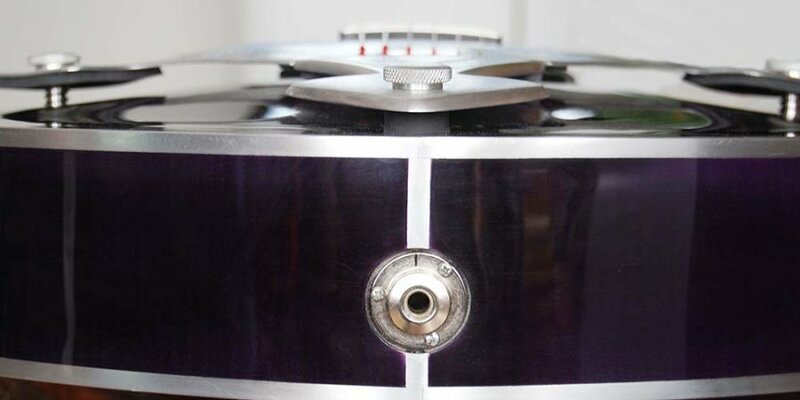 Innovative elements include the continuous fingerboard - which allows access to the very highest notes and supports the instrument’s sustain - as well as the hidden controls and rear-mounted tuning machines. 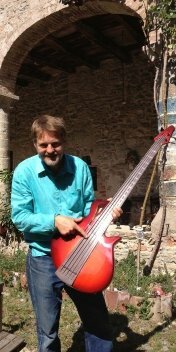 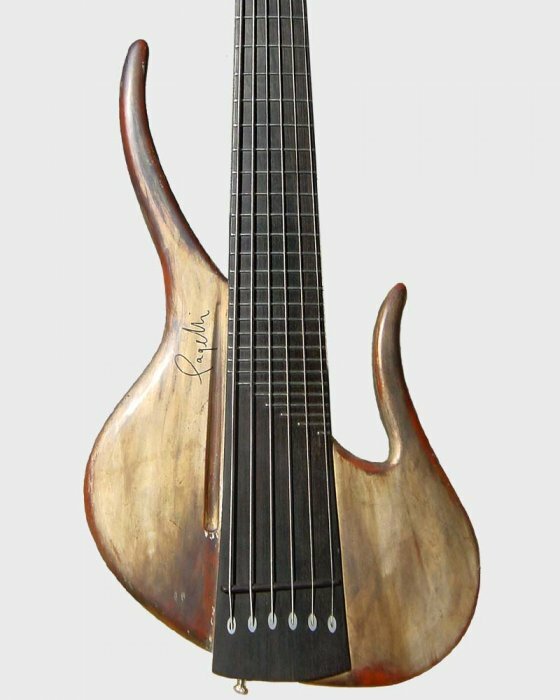 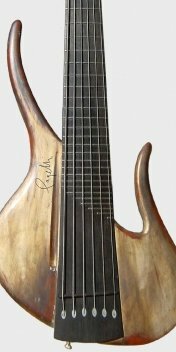 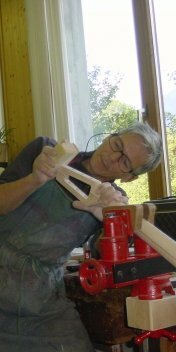 The idea was to build a fretless bass that eliminates everything that’s not absolutely necessary, thereby offering the purest tone possible. 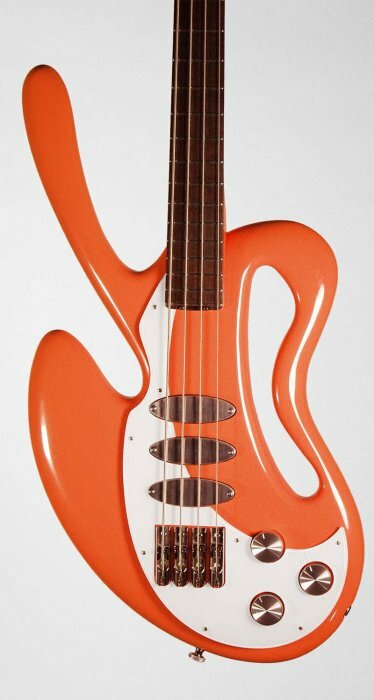 Naturally, the instrument’s finish also had to be unique. 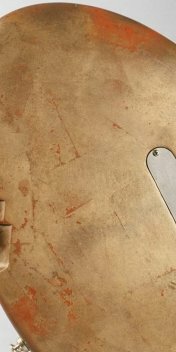 We originally thought about something that looks like rusted metal, but ultimately, we ended up with acid-treated gold leafing under a regular finish. 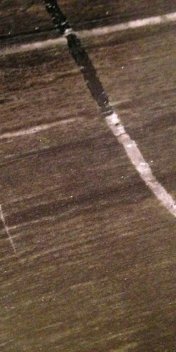 It’s a spooky look! 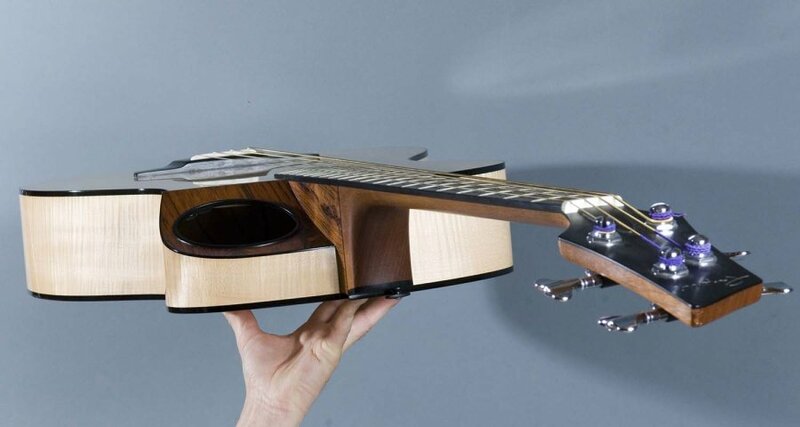 The innovation here is that it is really two guitars. 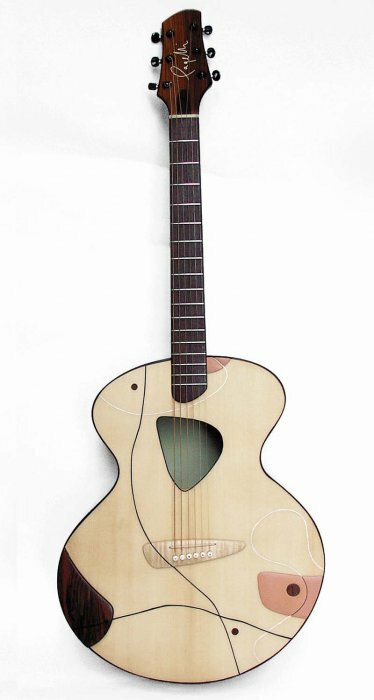 On the one hand, it’s an archtop with vaguely f-hole-like soundholes and a compressed voice. 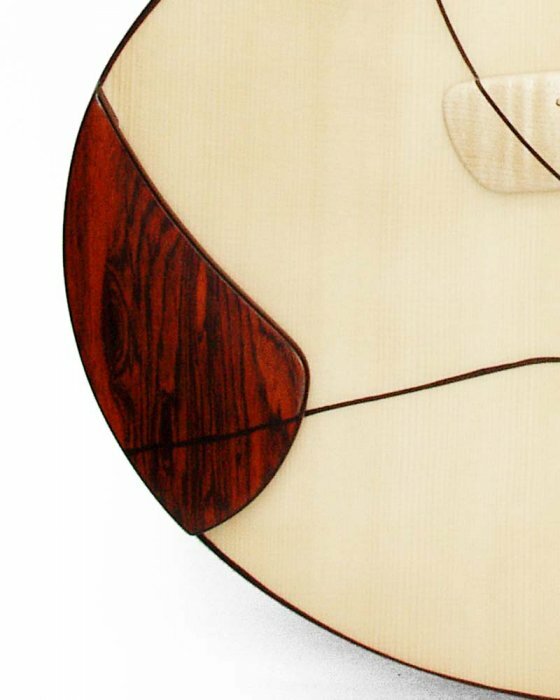 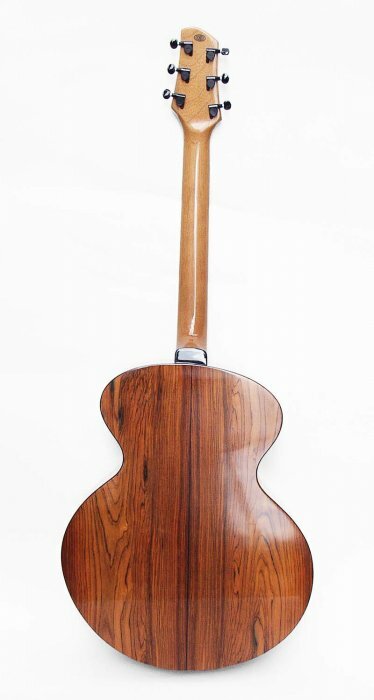 But once the cover is removed from the center soundhole, it sounds more open, similar to a Gypsy-jazz guitar. 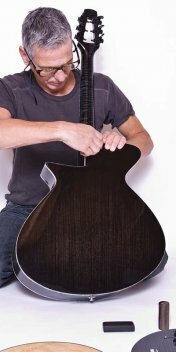 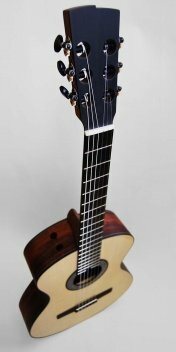 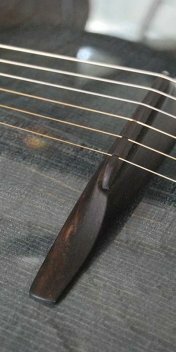 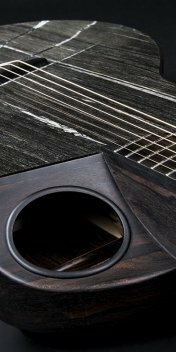 The fact that the ebony fingerboard disappears into the centered soundhole is more of a playful design than an innovation. 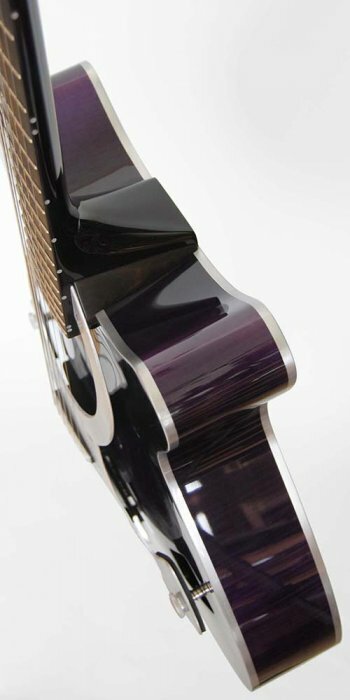 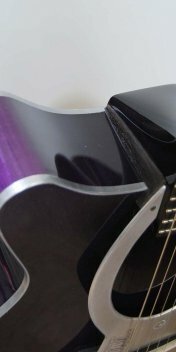 The same could be said about the tailpiece with its integrated saddle, but we think that these elements are really nice to look at! 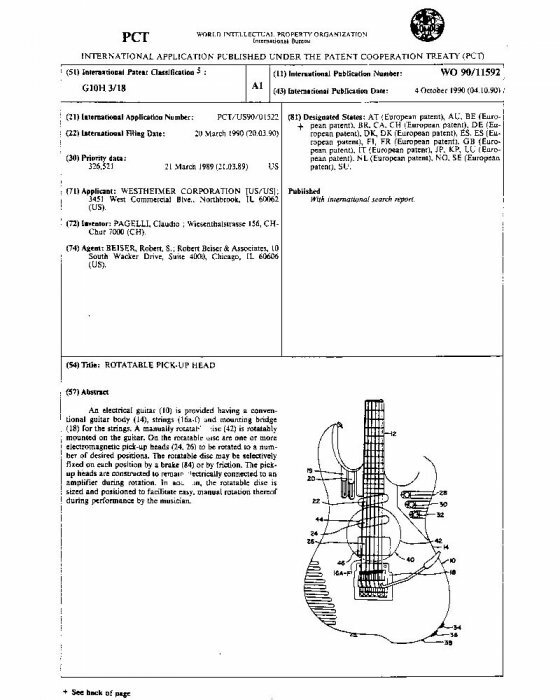 Our first patent! 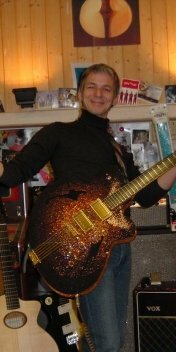 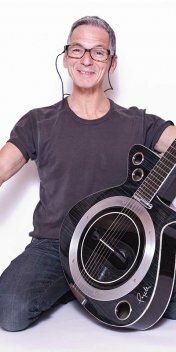 It didn’t do us much good, and we didn’t know the guy who first wanted to buy the guitar, so we sold it to someone else - after all, who knew about Joe Satriani at the time? 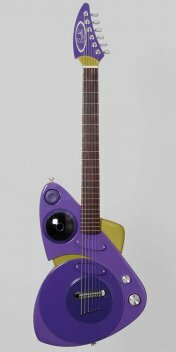 As a result, the rotating pickup guitar became a curiosity of musical instrument history. 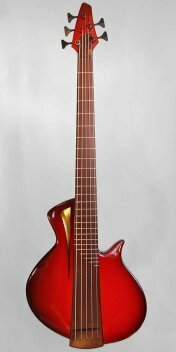 But the possibilities were endless: It has stereo outputs, which meant that a quarter turn of the two-pickup assembly meant that one only amplified the bass strings, while the other picked up the trebles. 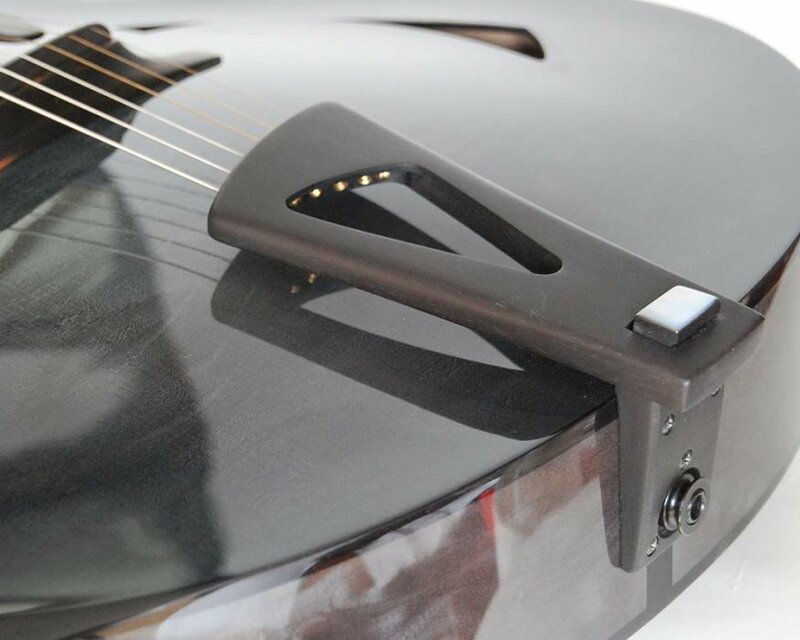 You could strum, and the sound would go back and forth, from one speaker to the other! 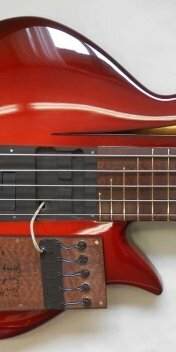 Or you could put a distorted sound on the bass strings and a delay on the trebles, etc. 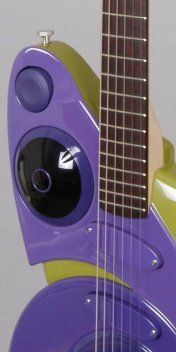 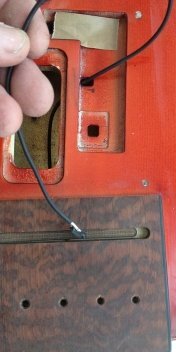 The guitar’s switches were touch-sensitive designs, the controls were faders rather than pots, and the position markers built into the side of the fingerboard lit up. 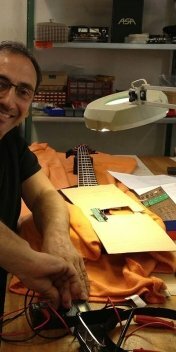 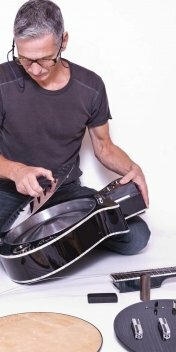 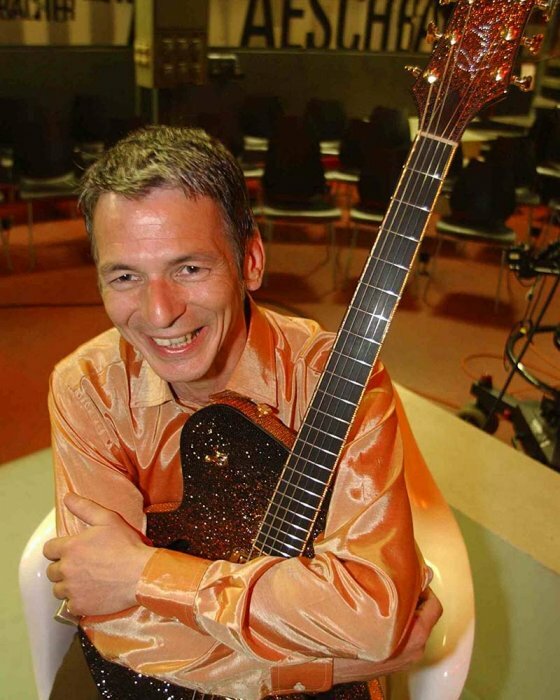 It was an instrument with many possibilities, but what guitarist really wants that?